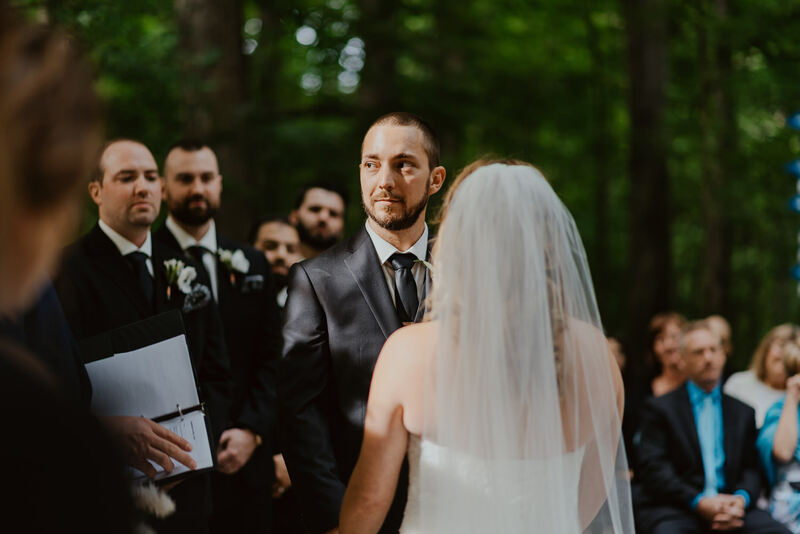 From the day I met Andrea and Chris I knew their wedding would be filled with a lot of heart. 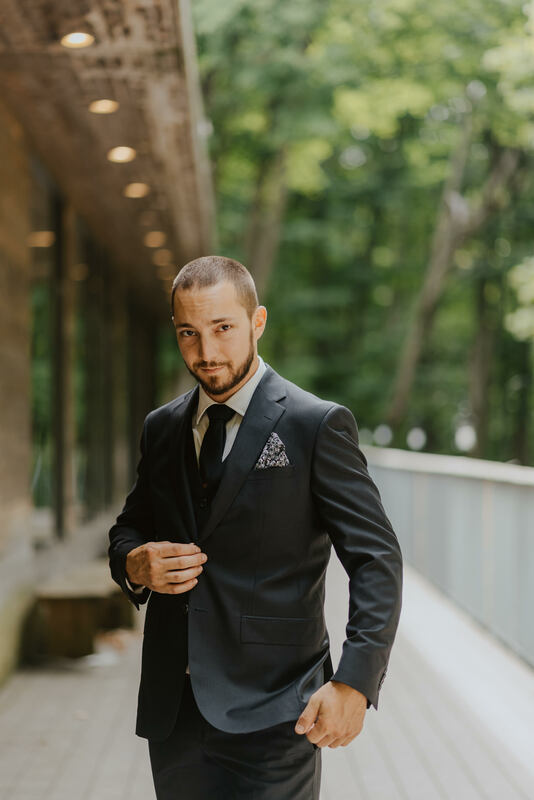 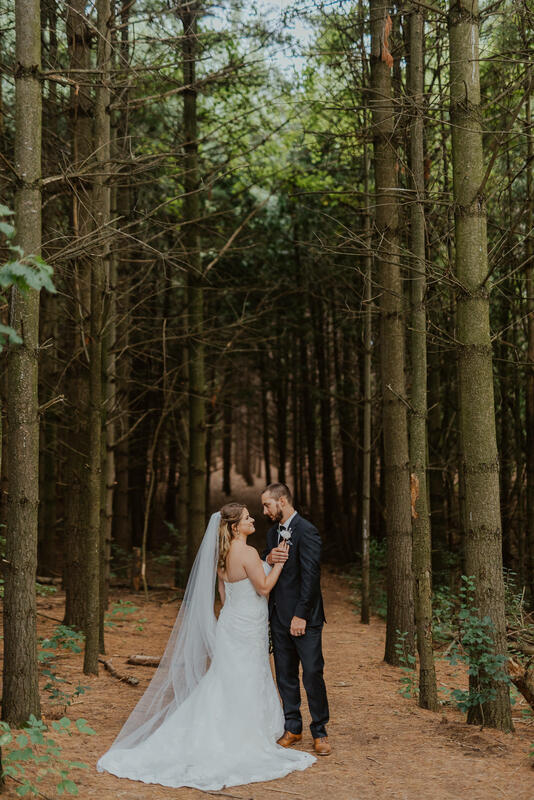 As a Toronto wedding photographer I have shot many engagement sessions at Kortright, but this was my first wedding at the Kortright Centre. 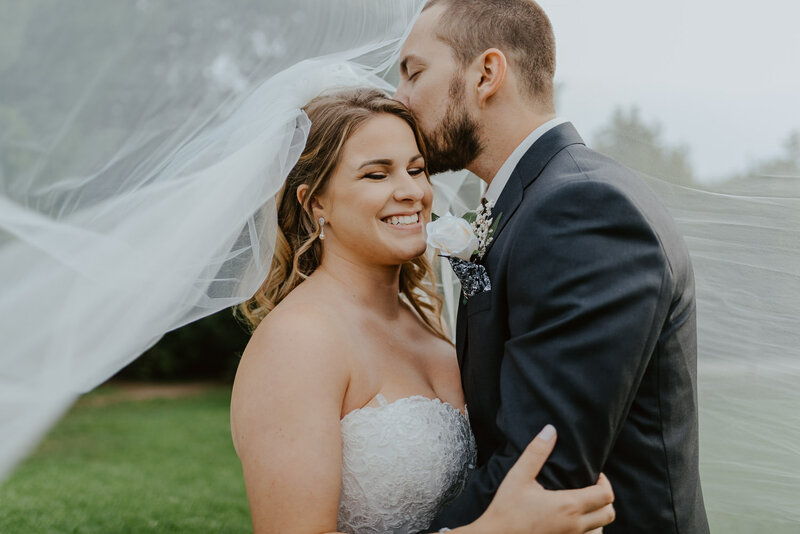 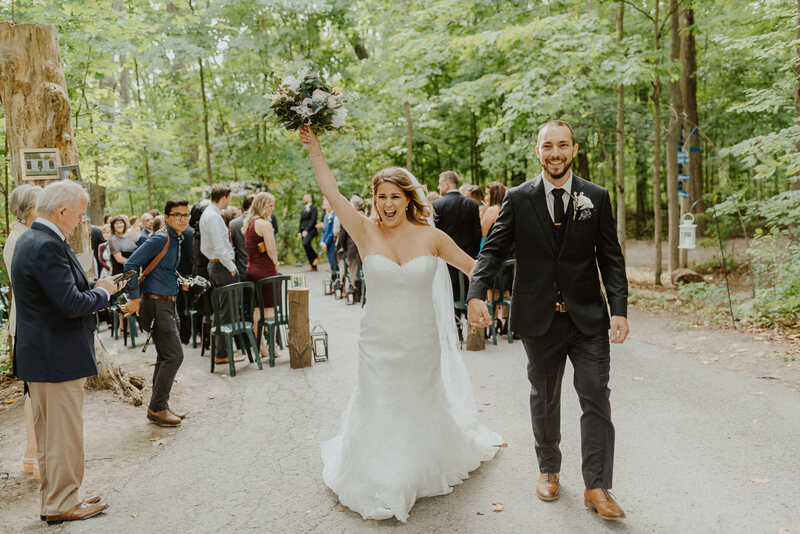 Andrea and Chris met while studying at the University of Guelph. 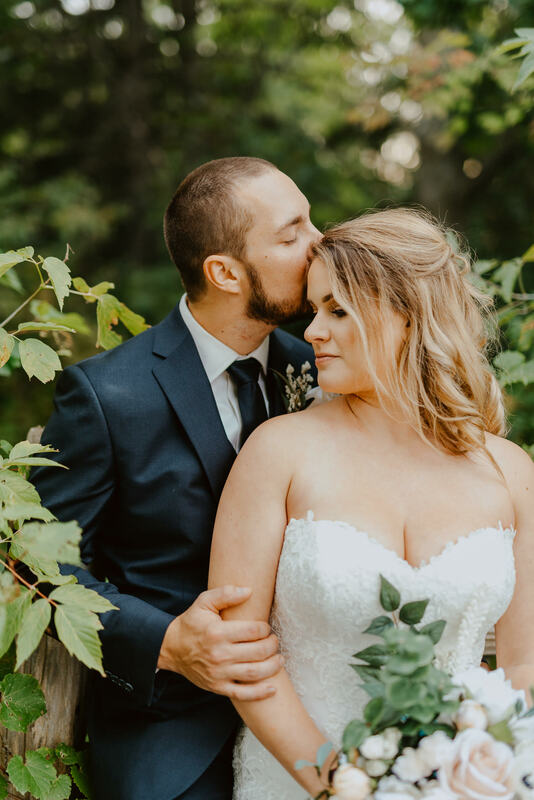 They spent most of their summers together camping around Ontario. 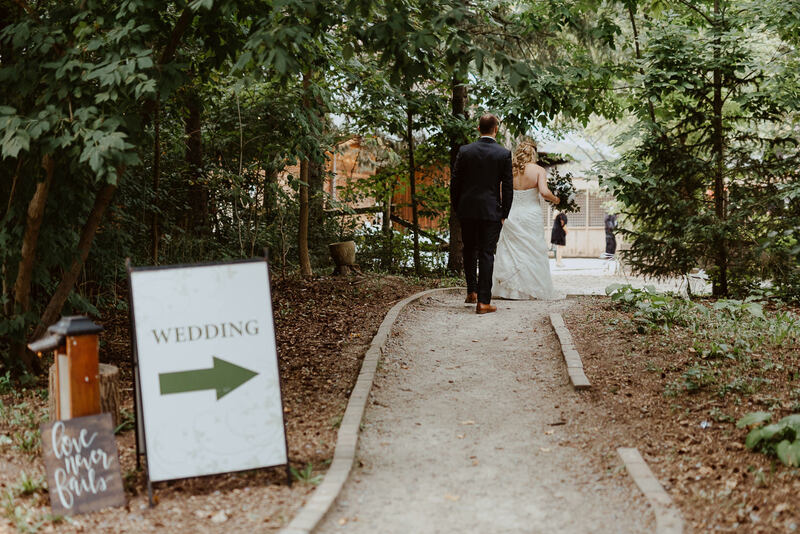 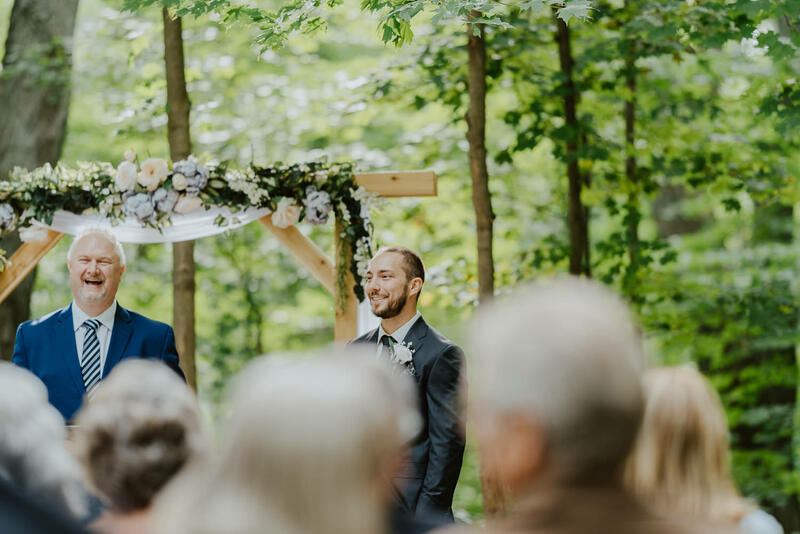 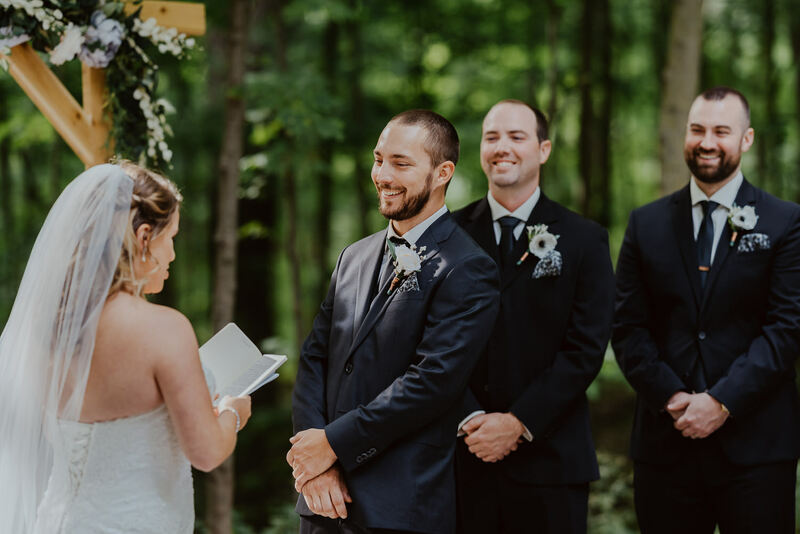 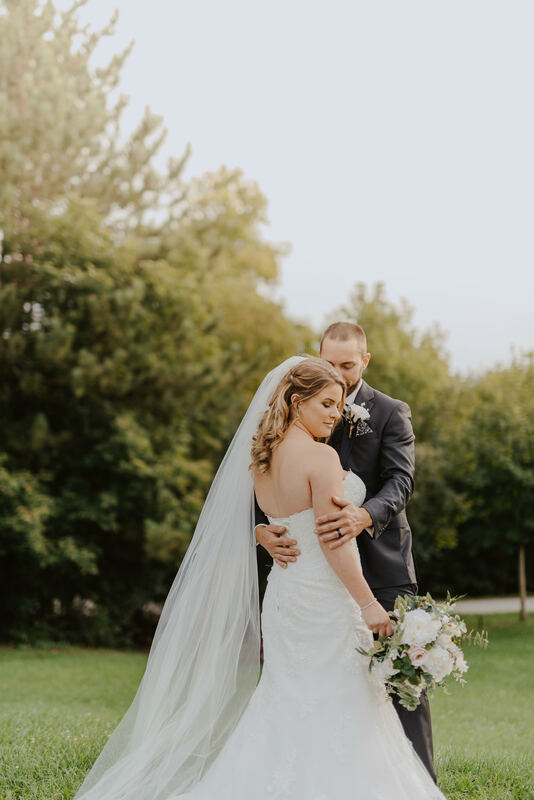 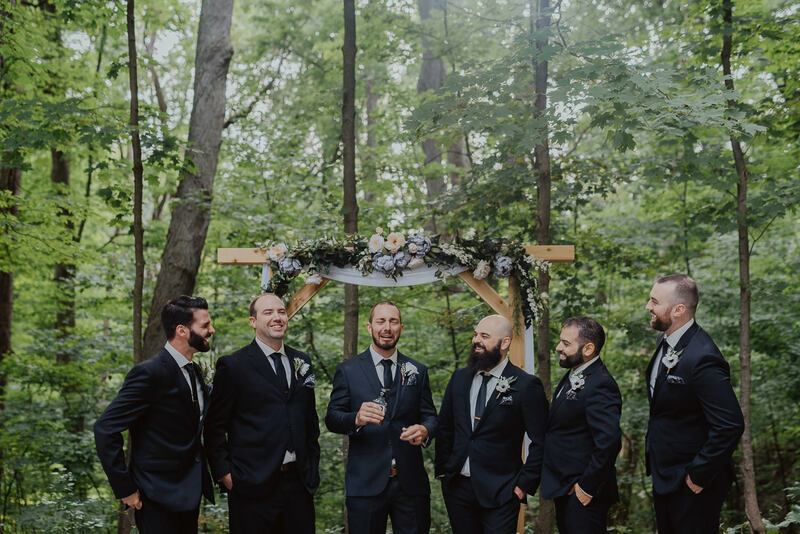 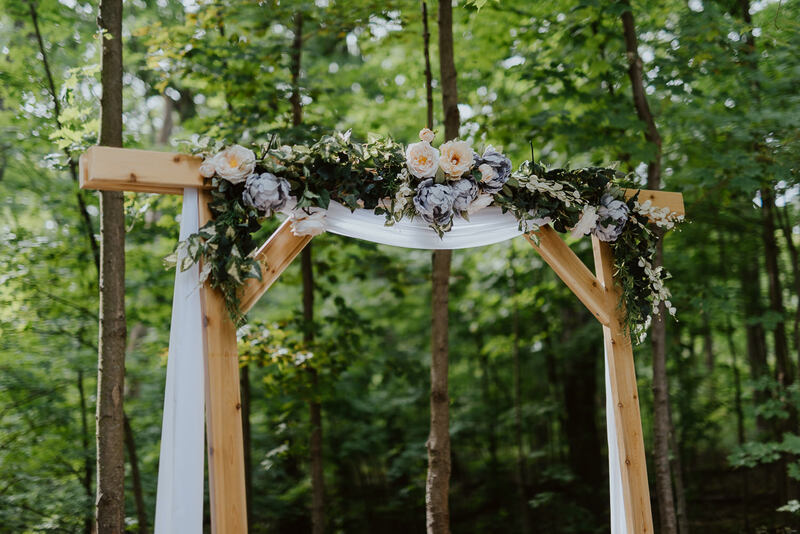 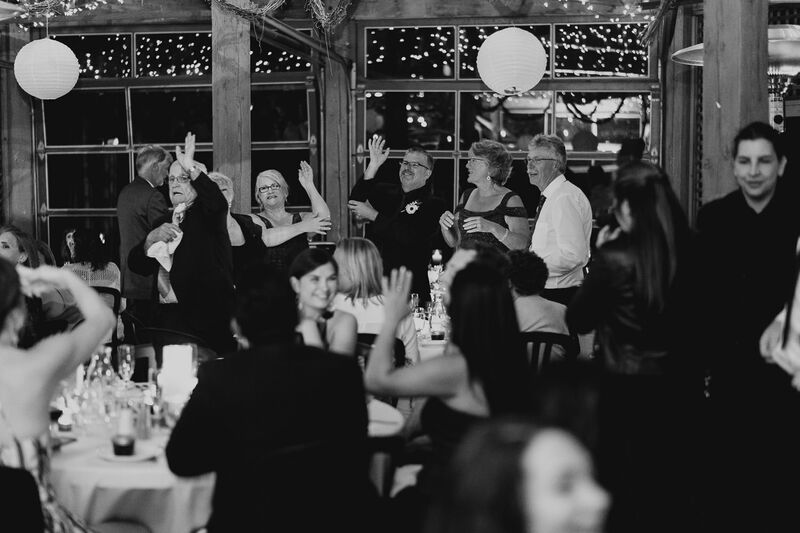 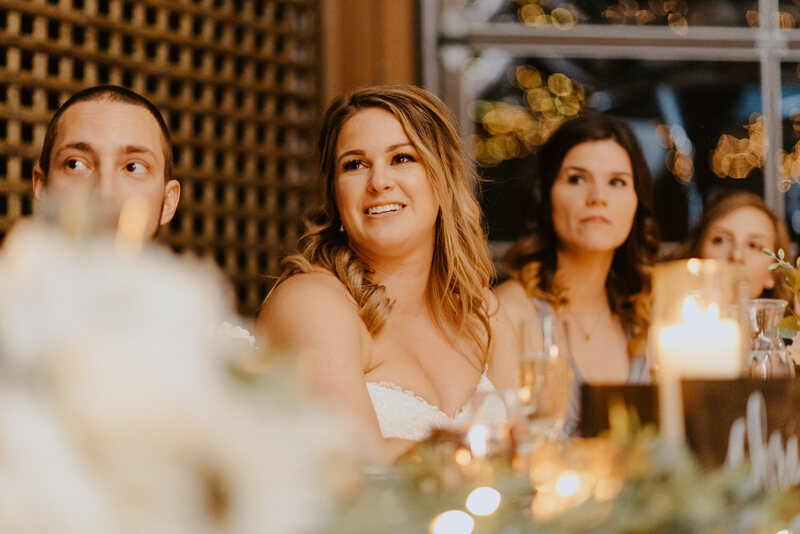 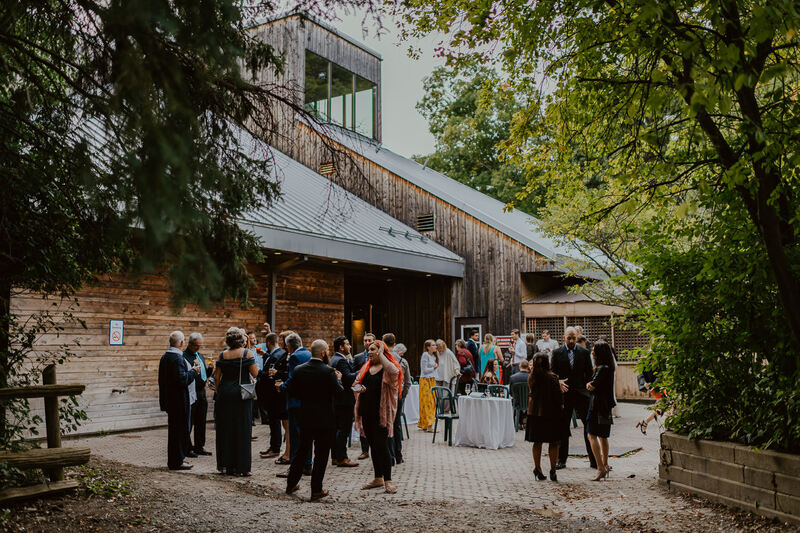 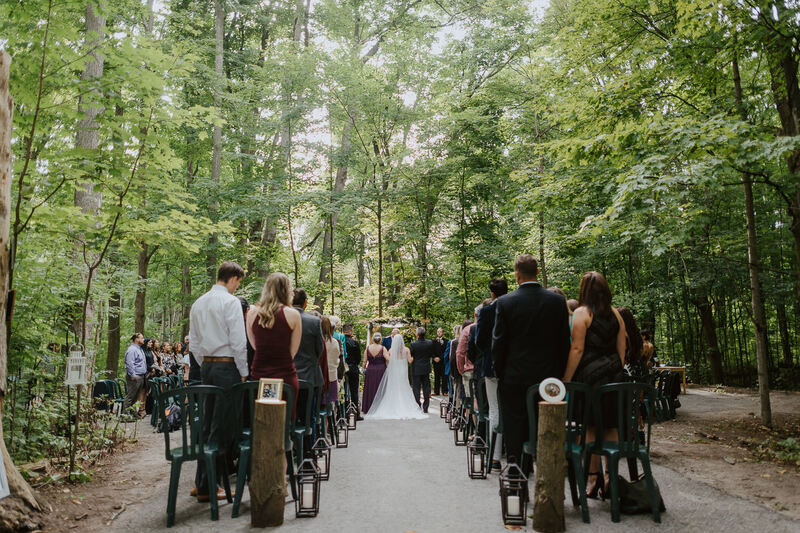 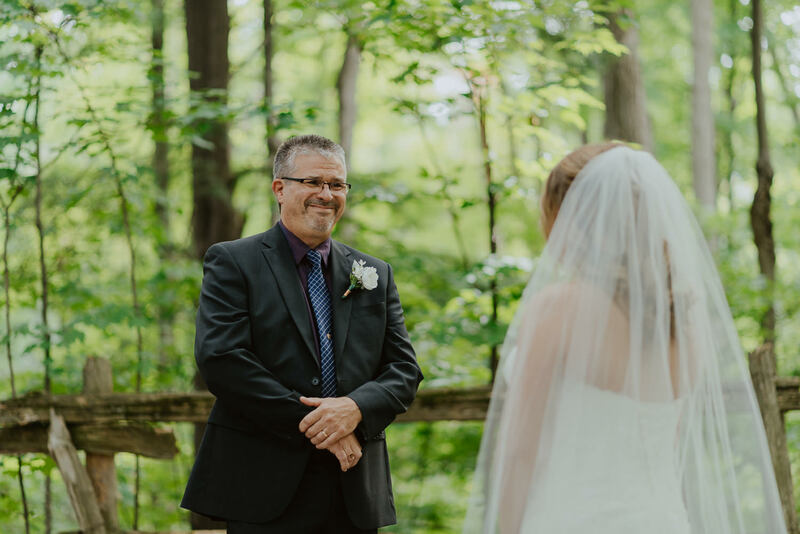 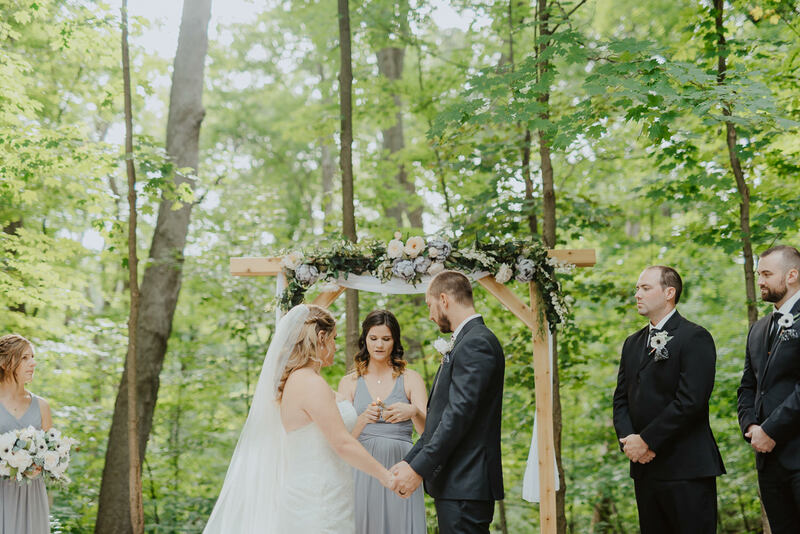 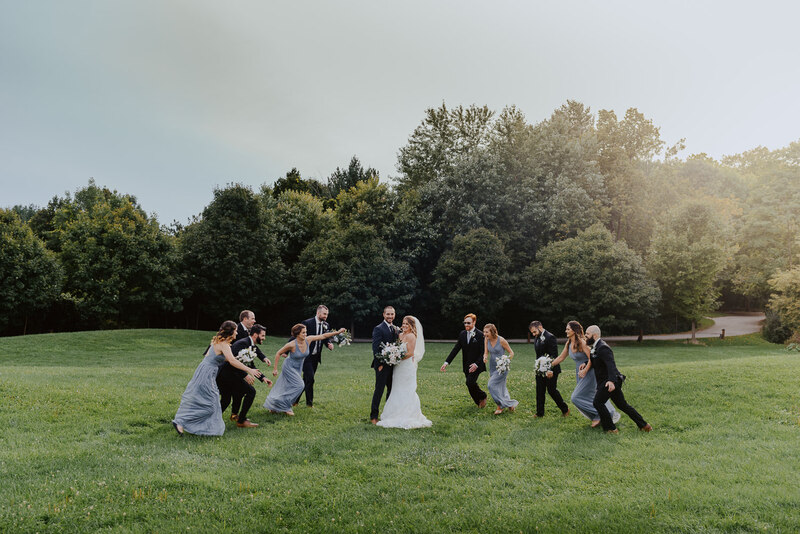 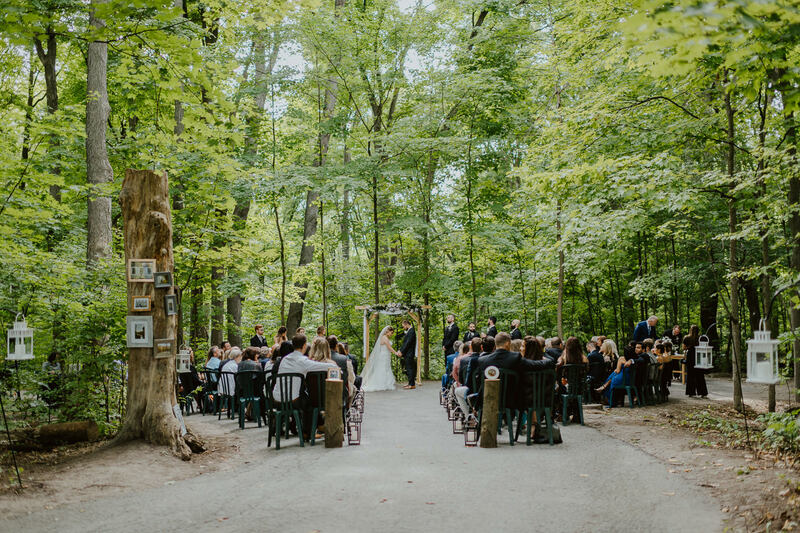 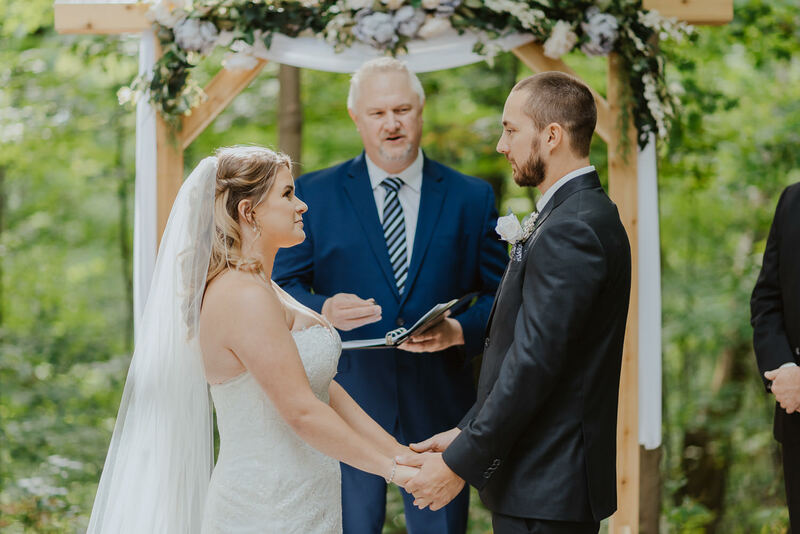 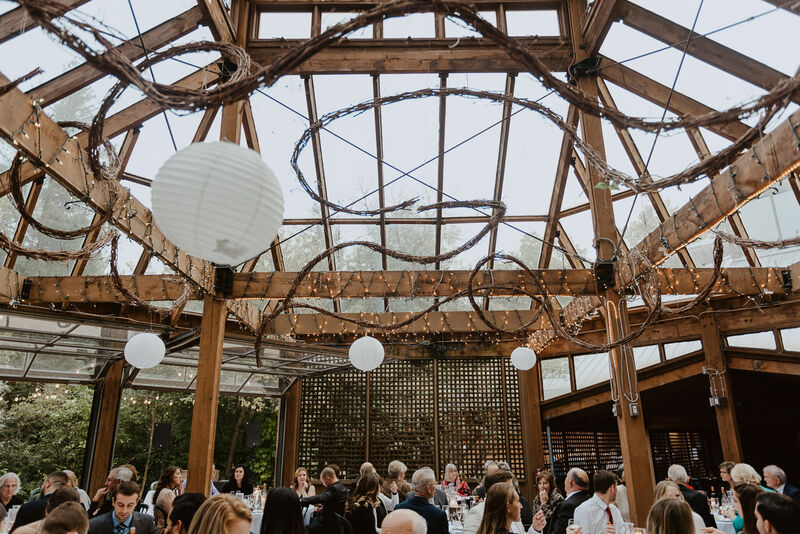 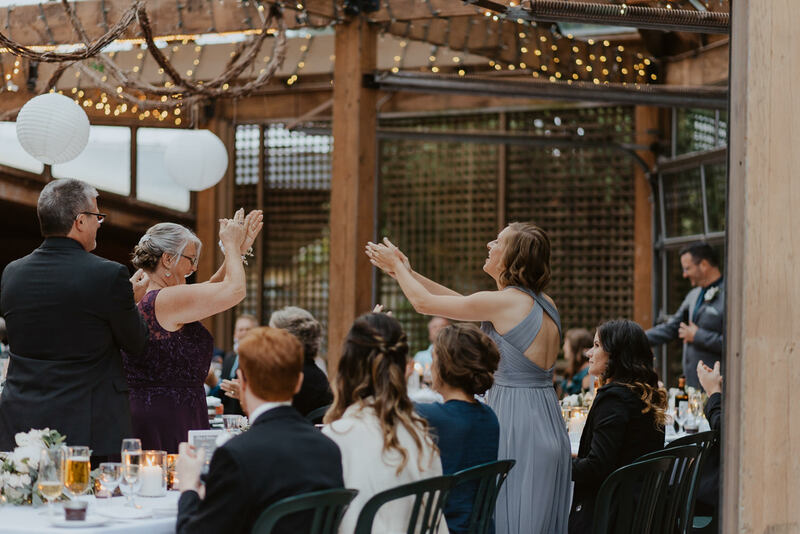 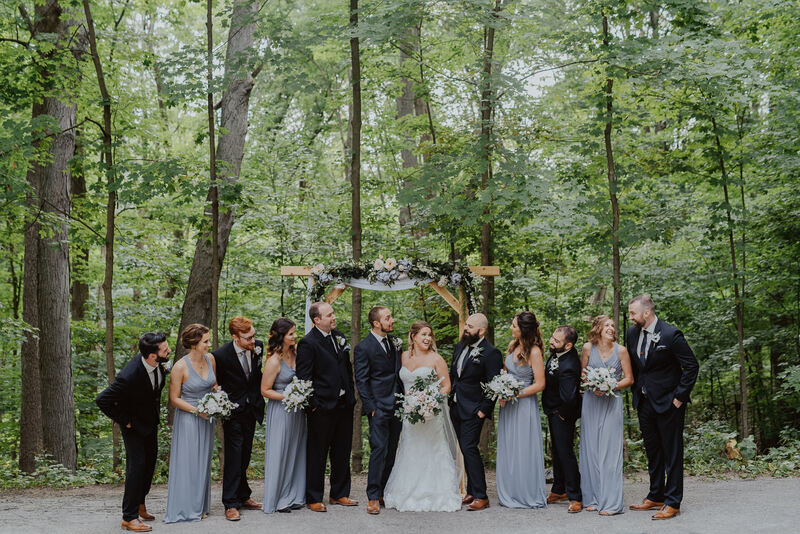 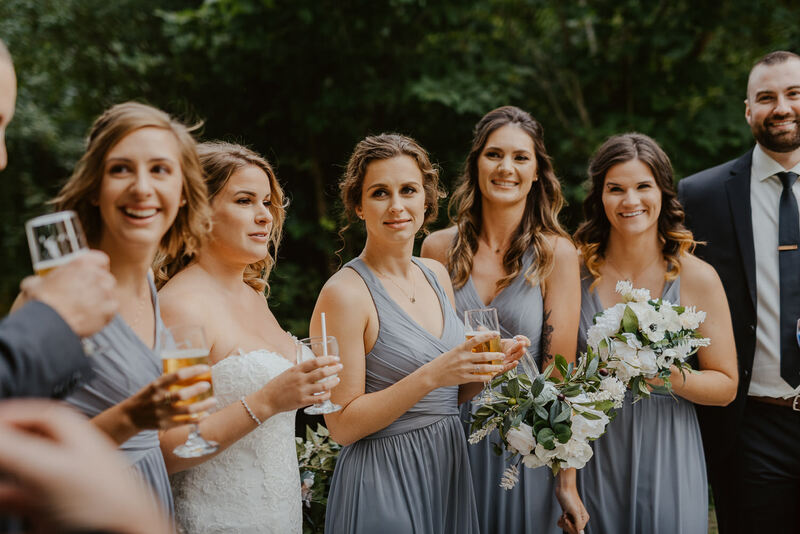 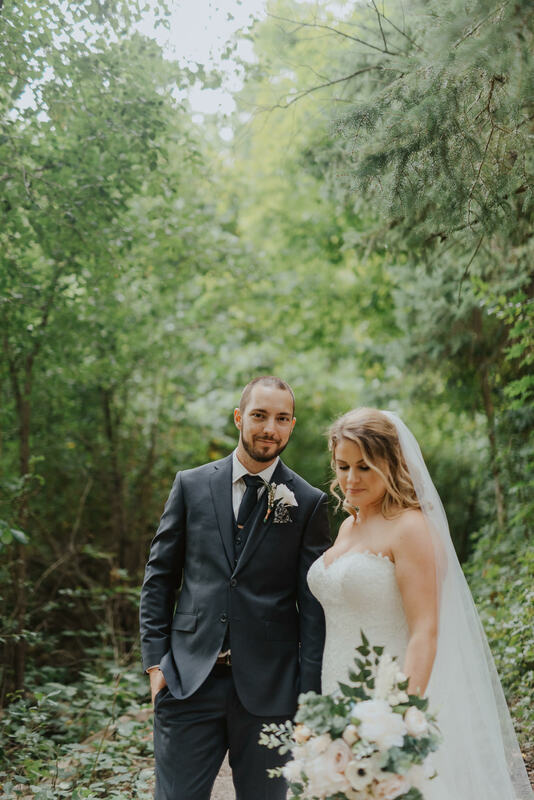 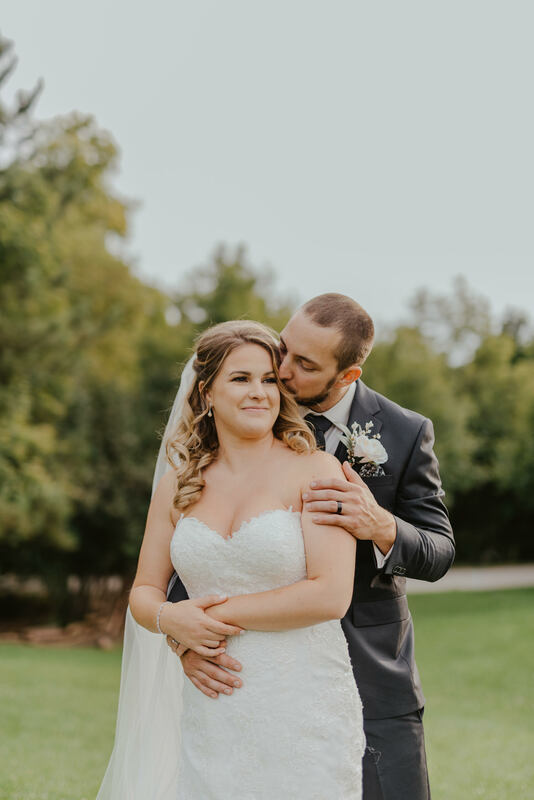 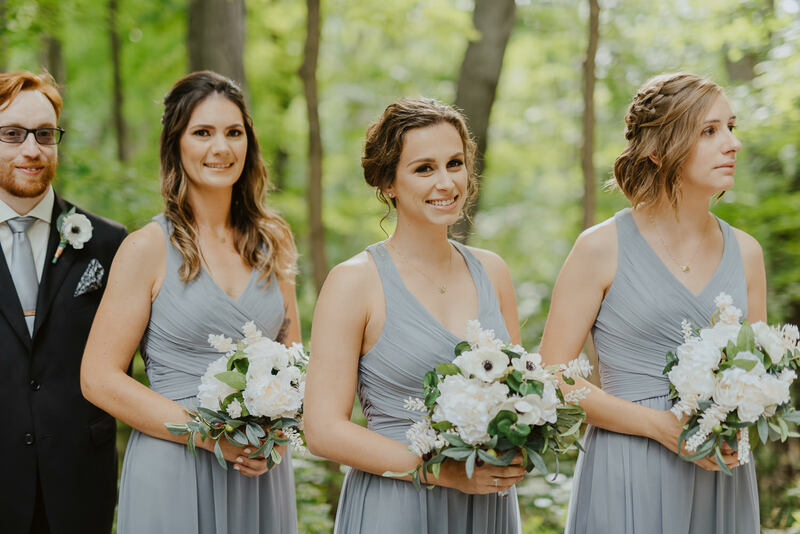 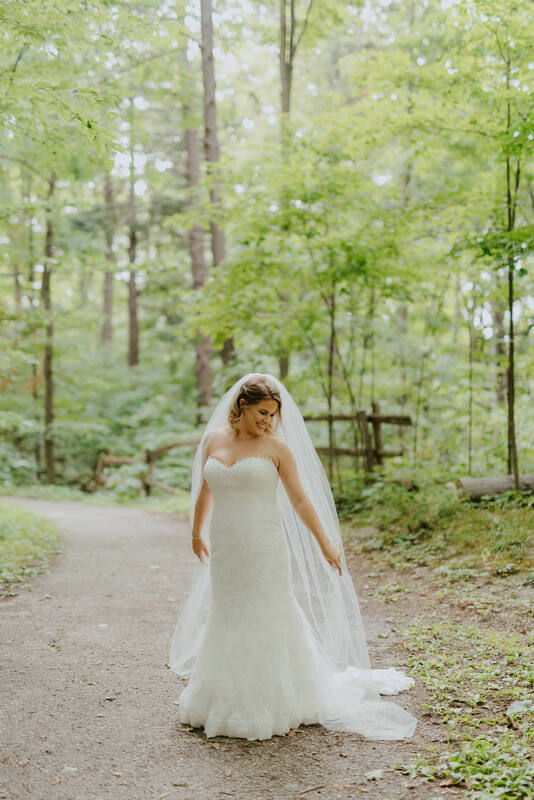 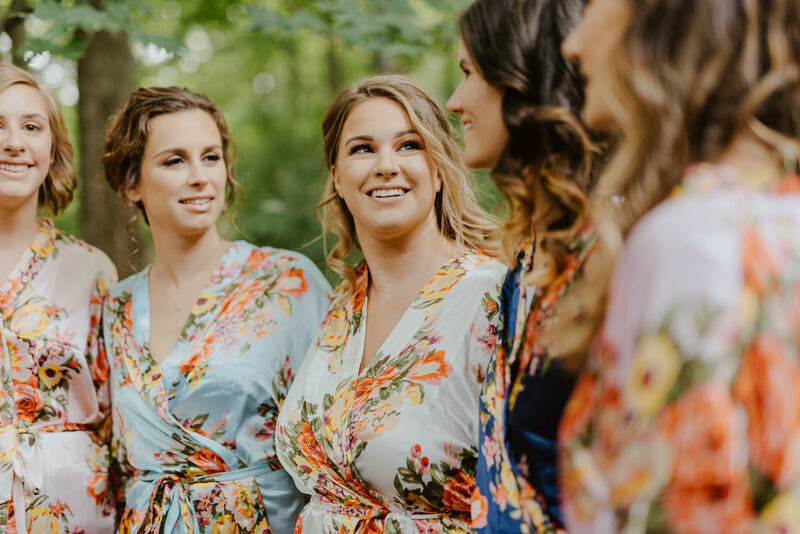 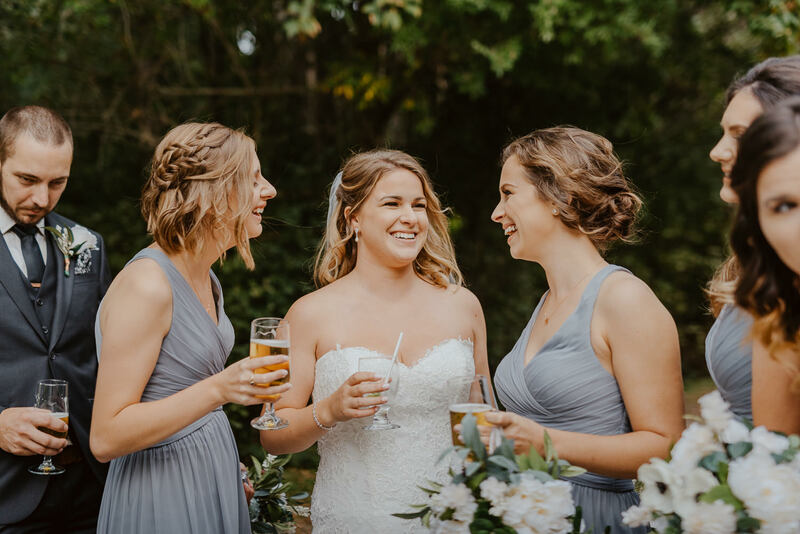 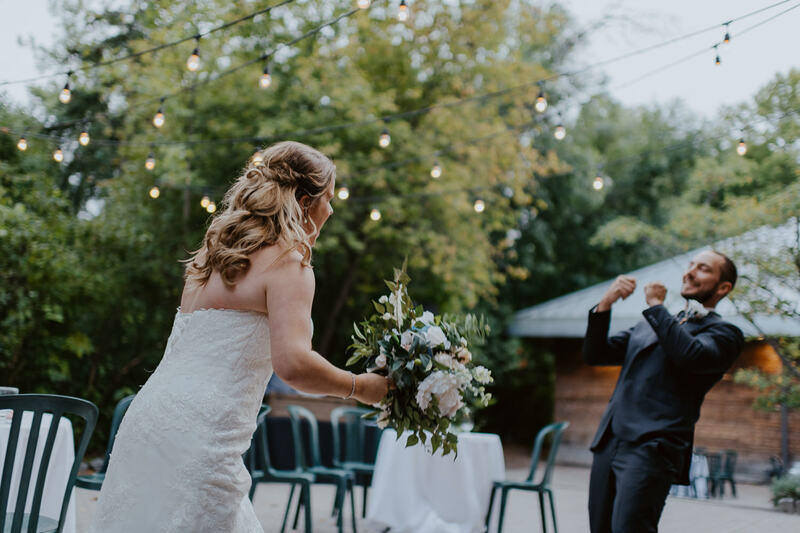 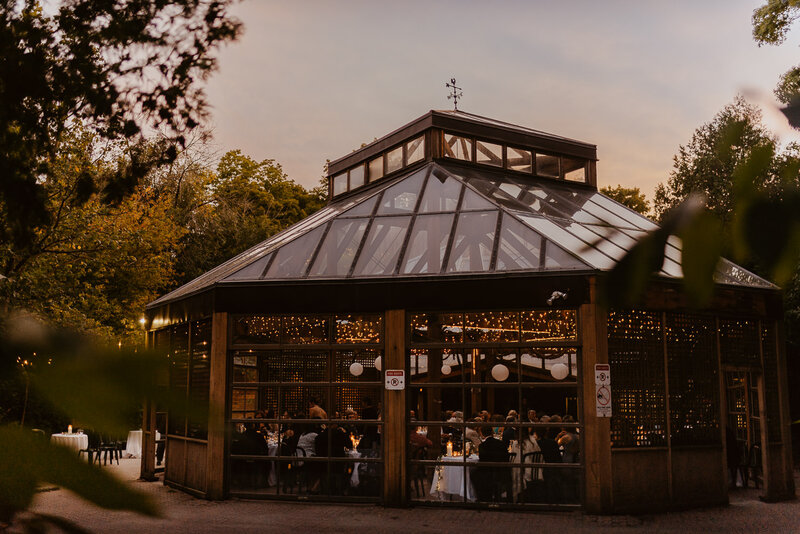 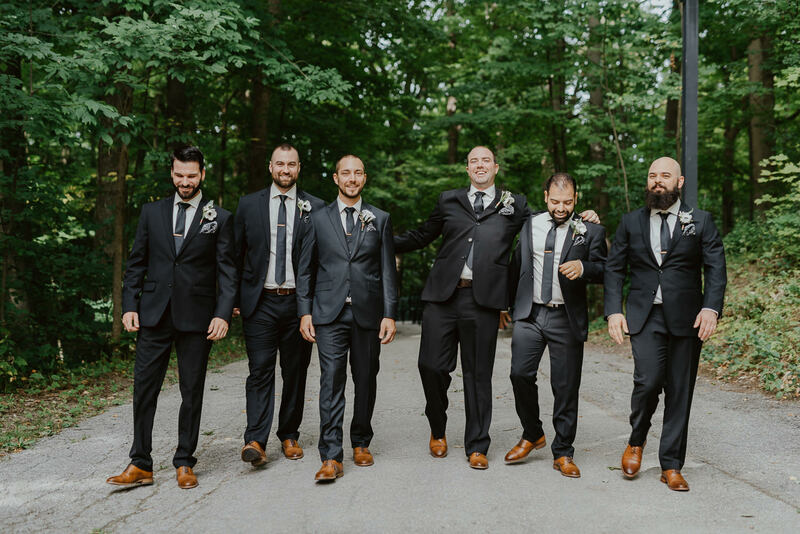 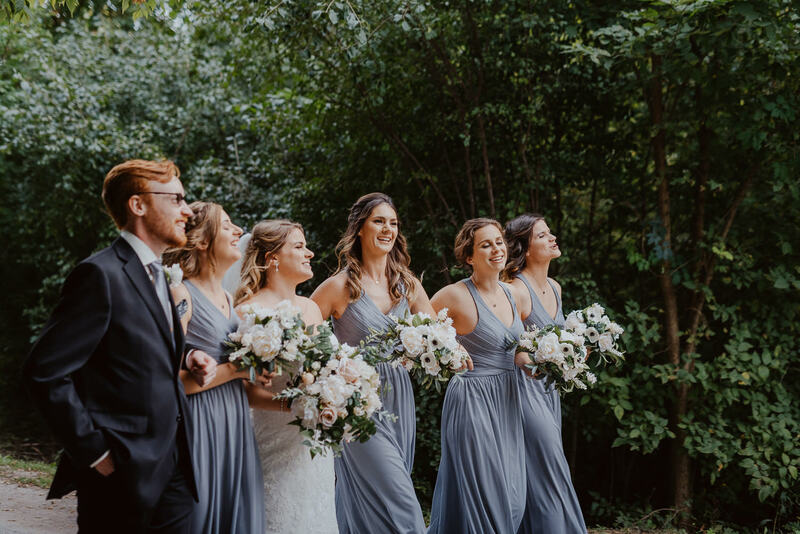 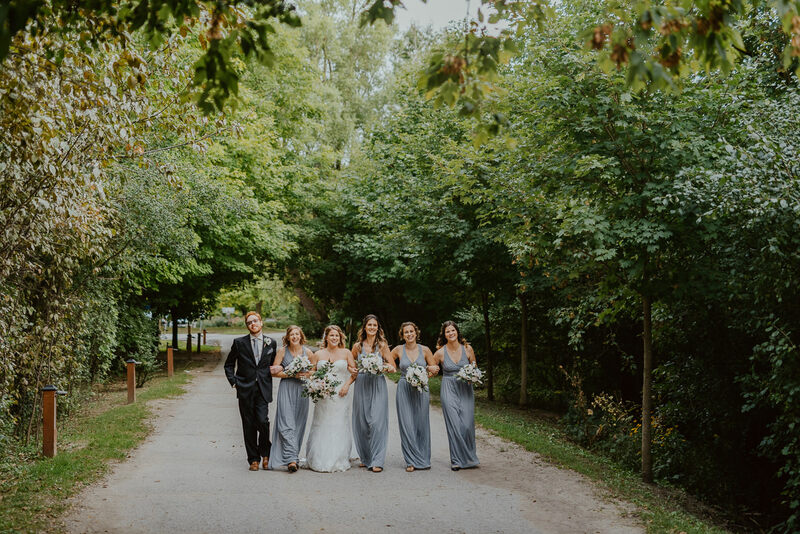 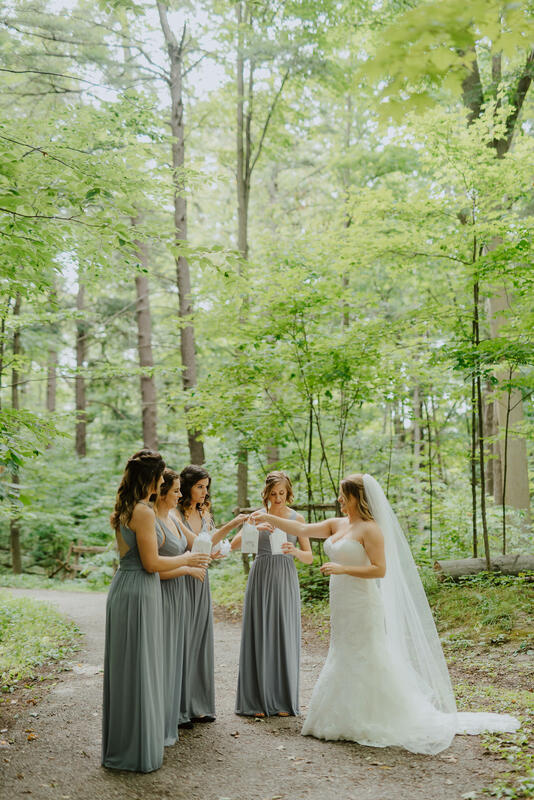 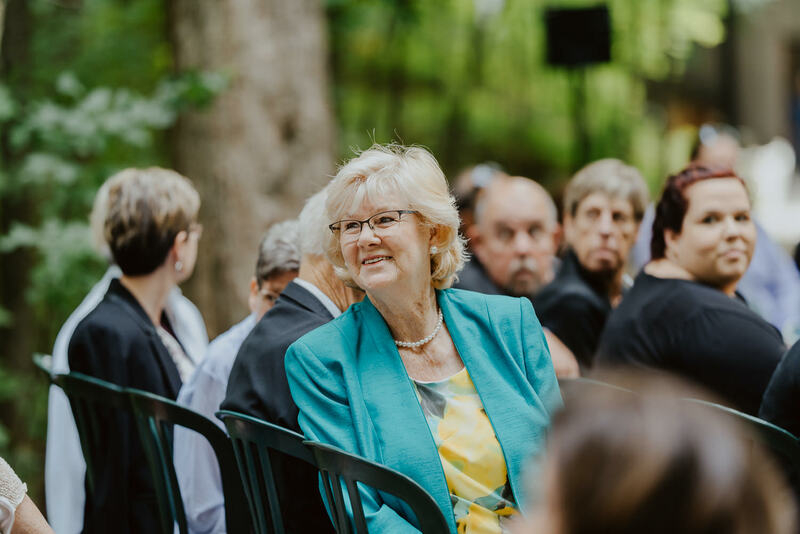 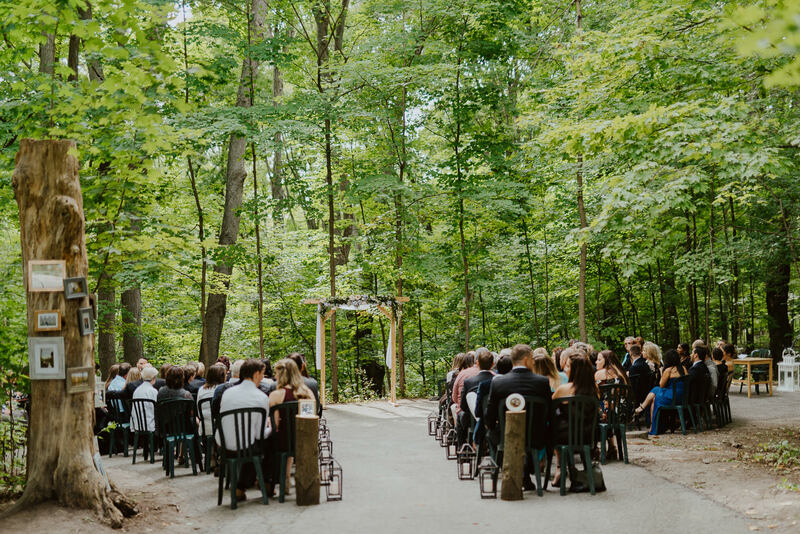 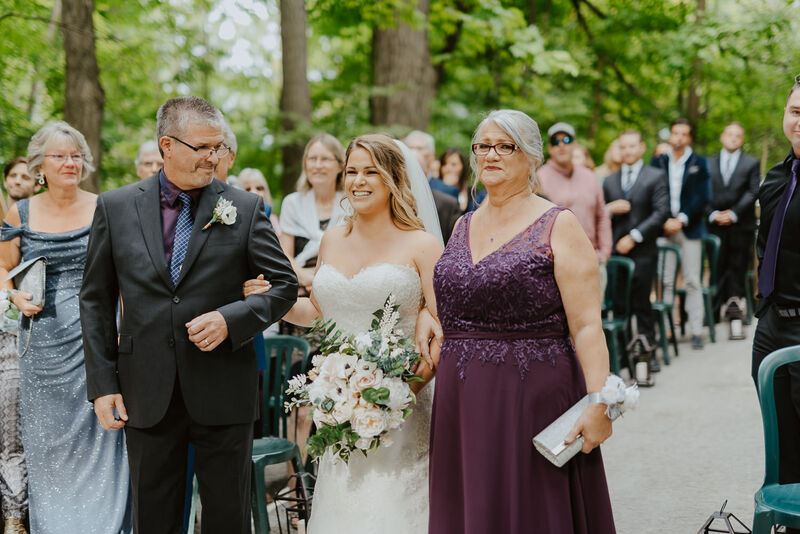 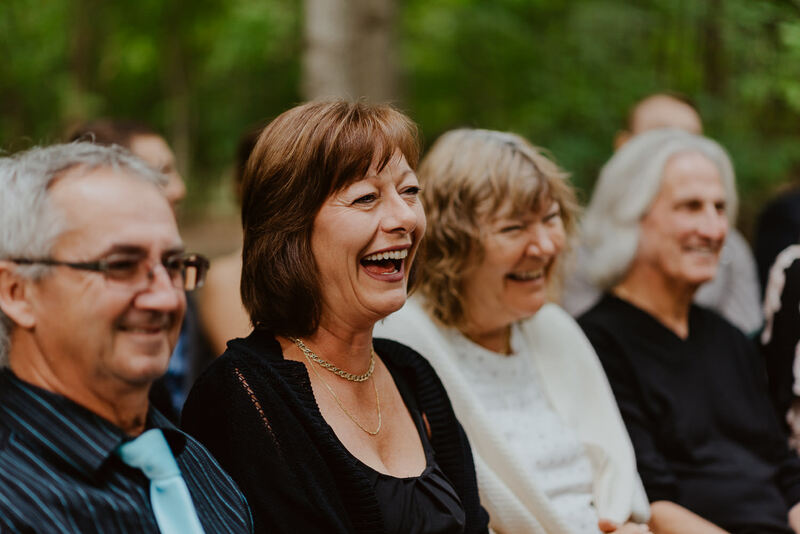 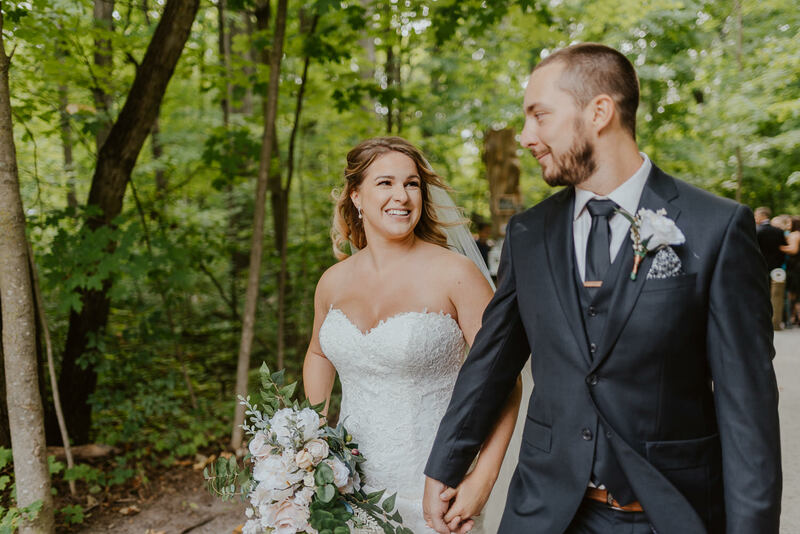 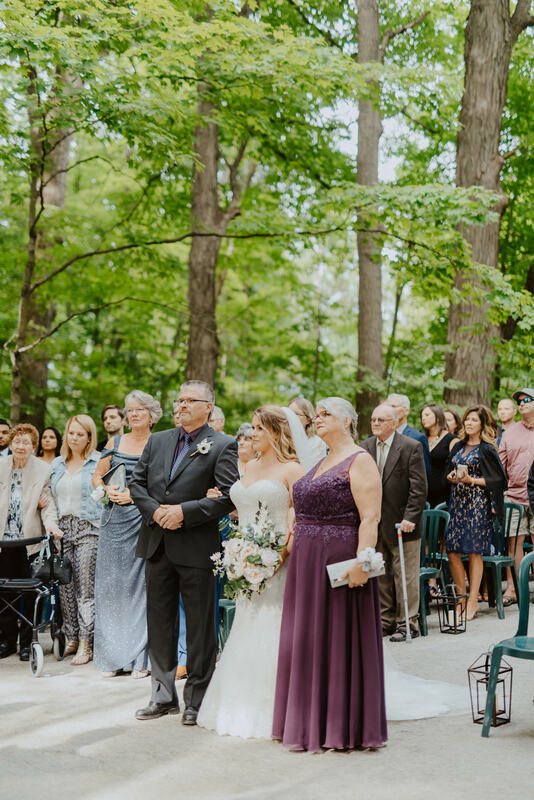 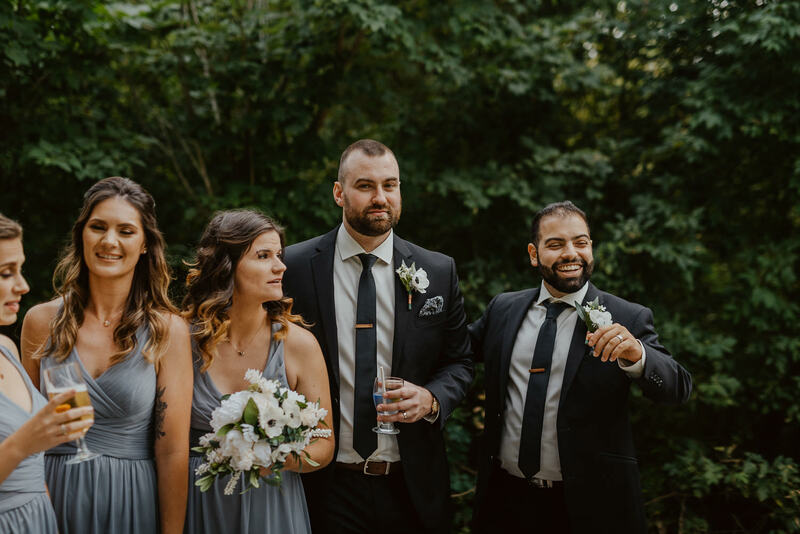 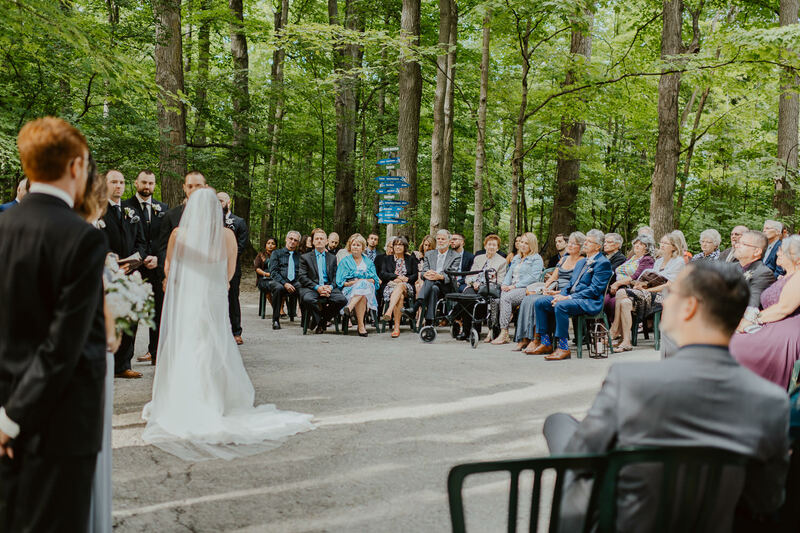 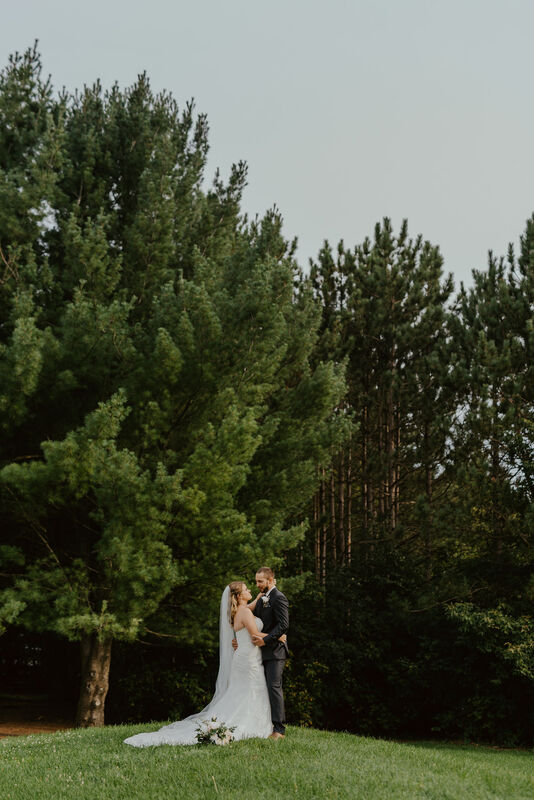 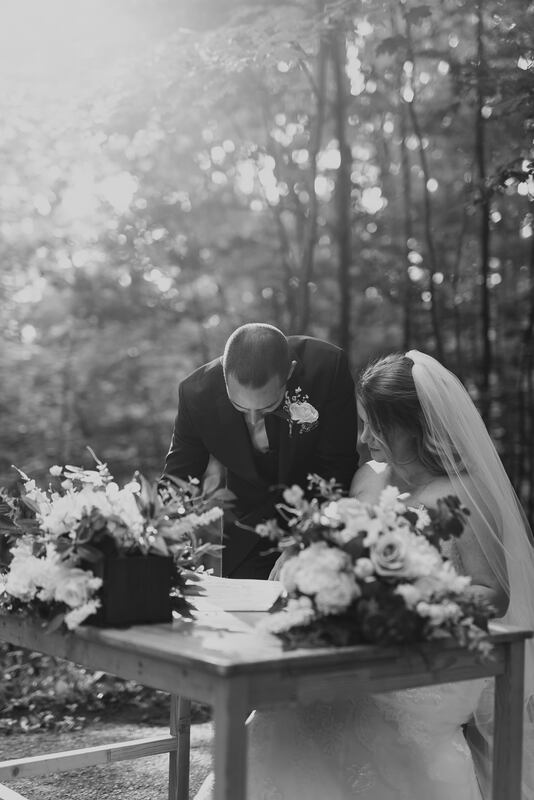 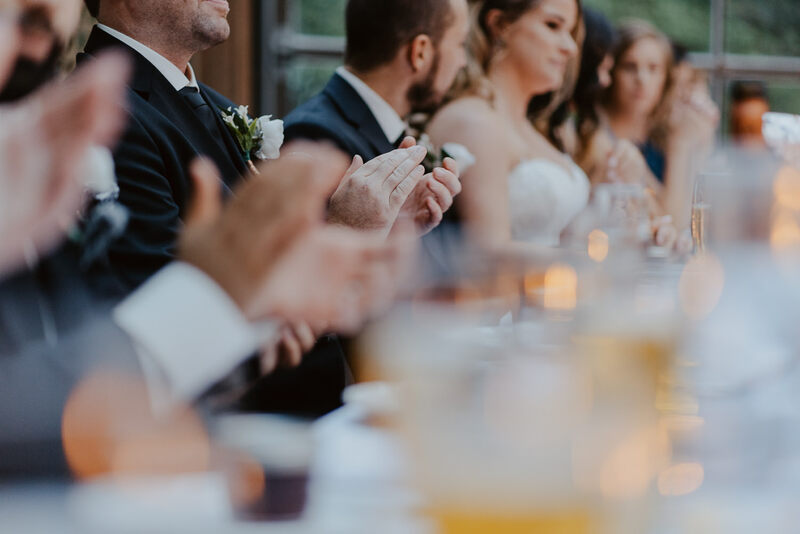 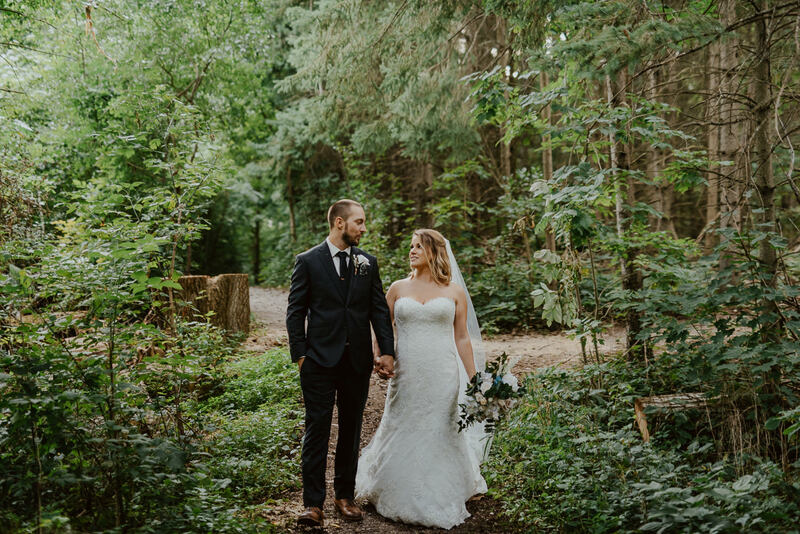 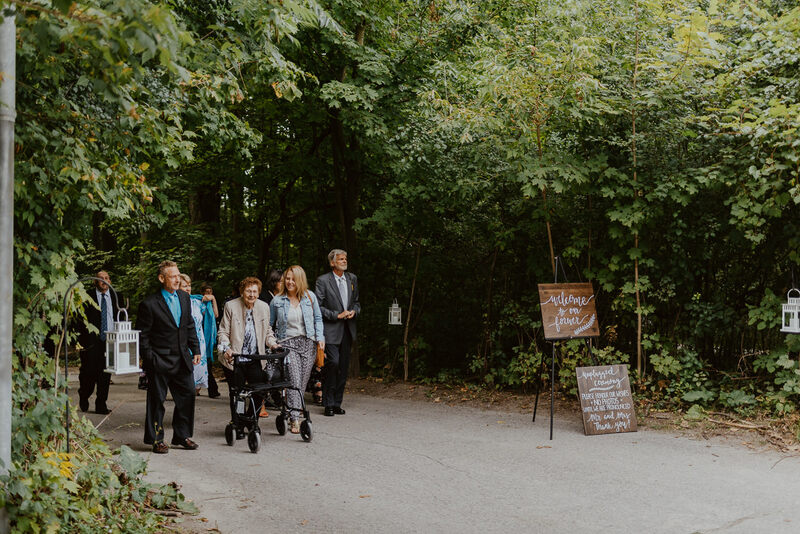 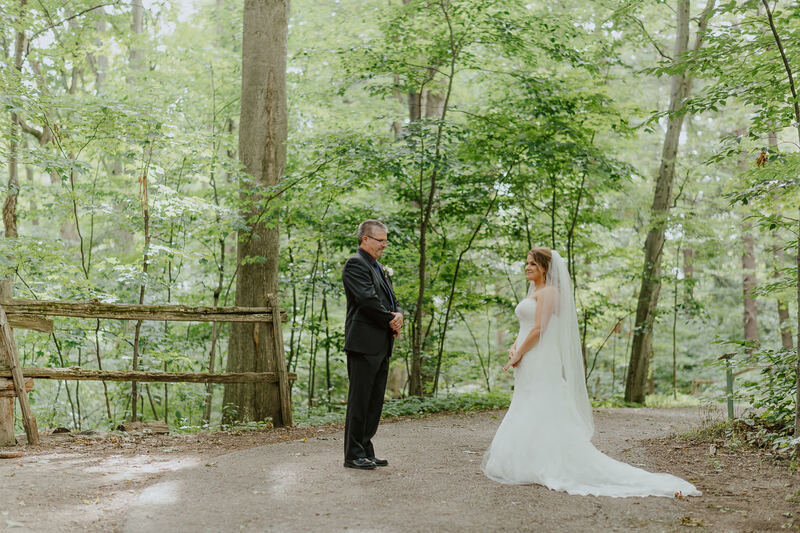 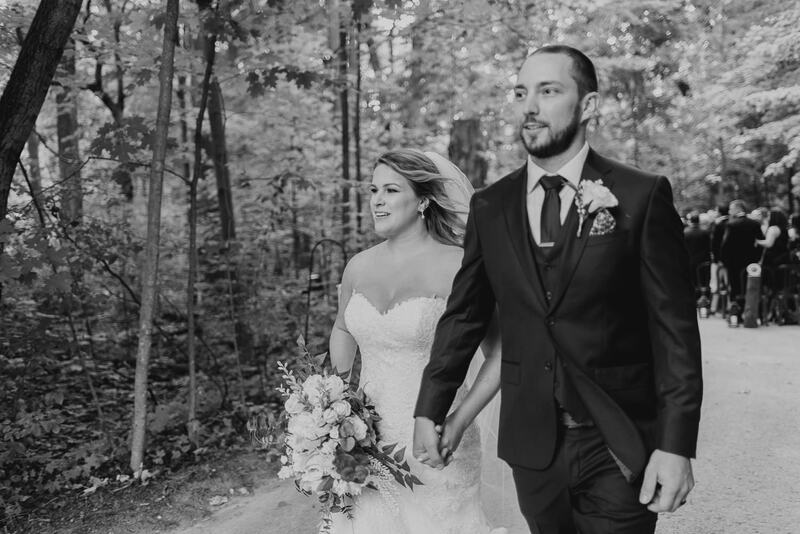 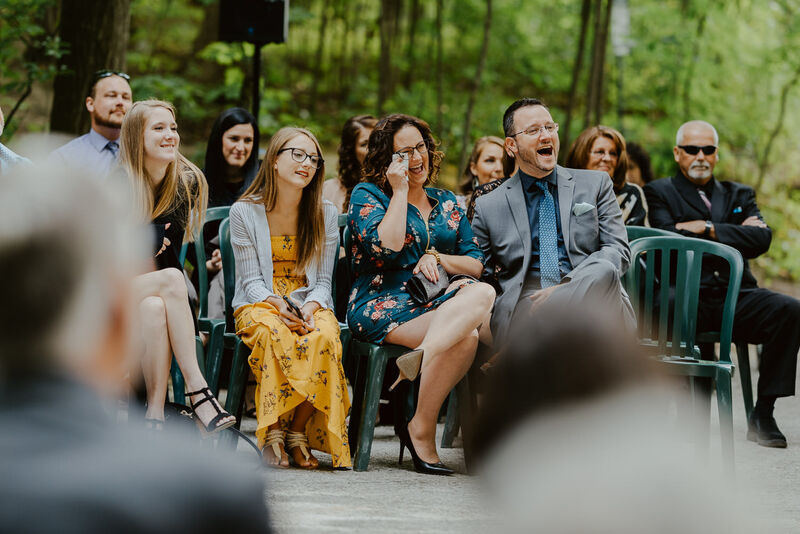 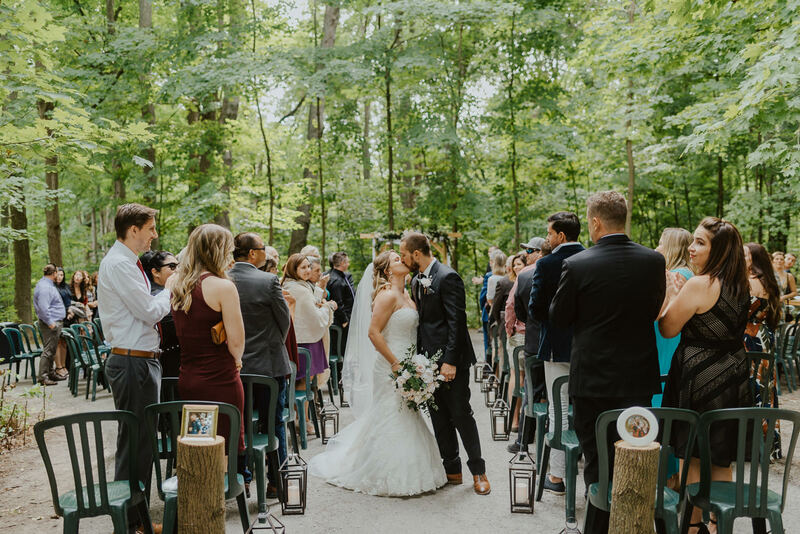 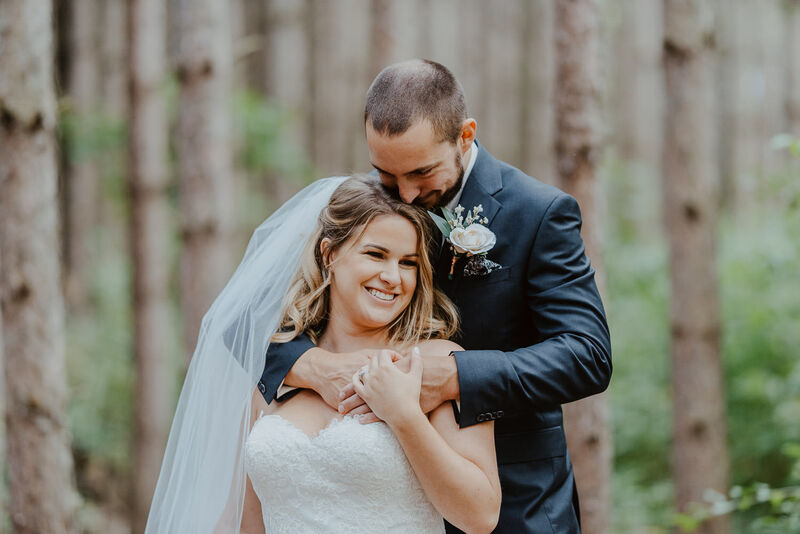 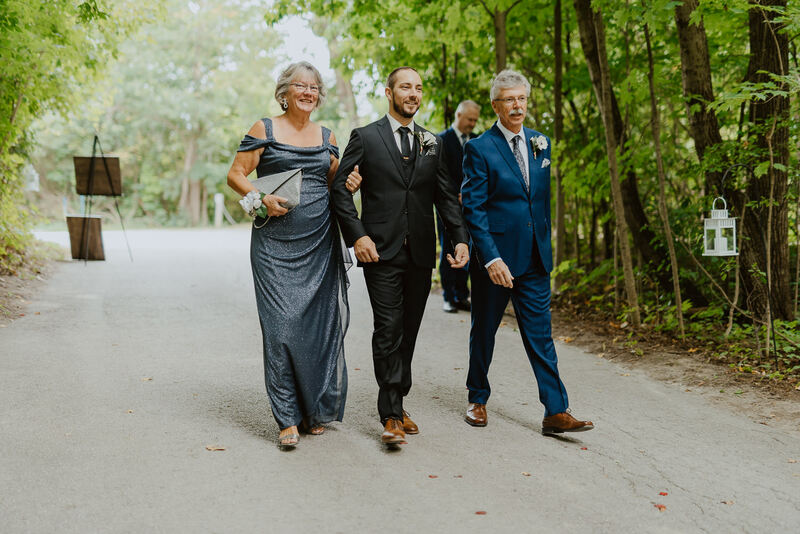 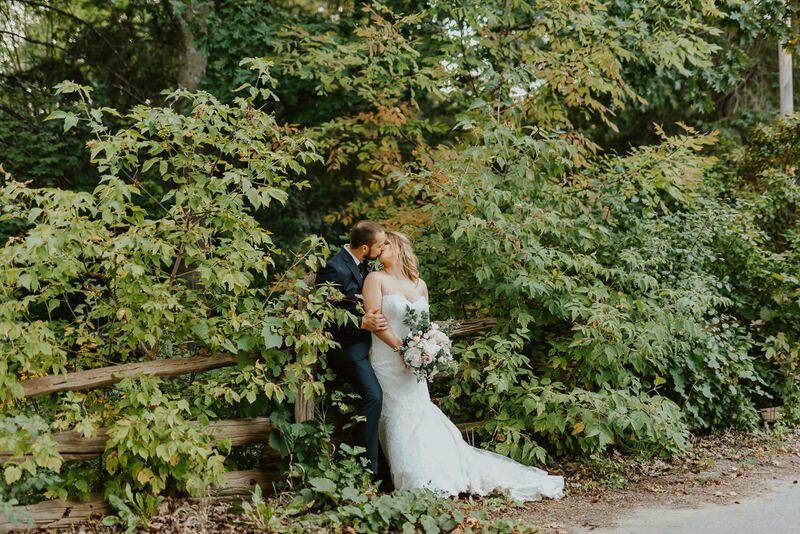 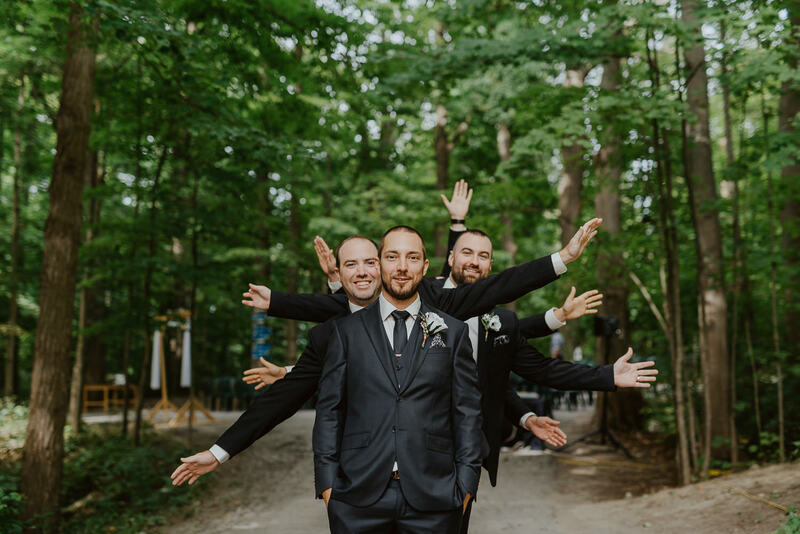 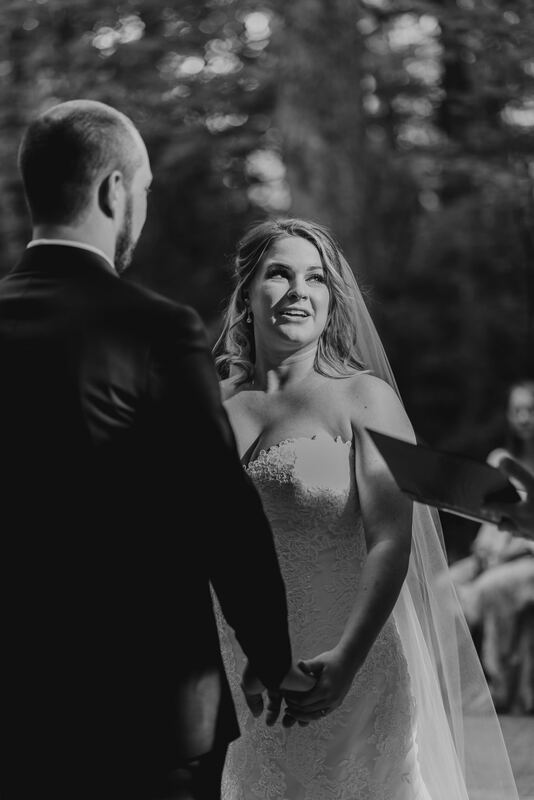 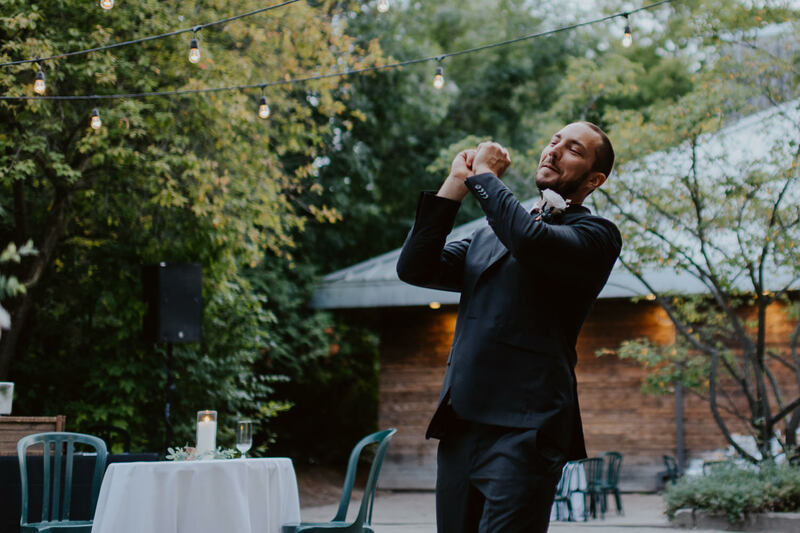 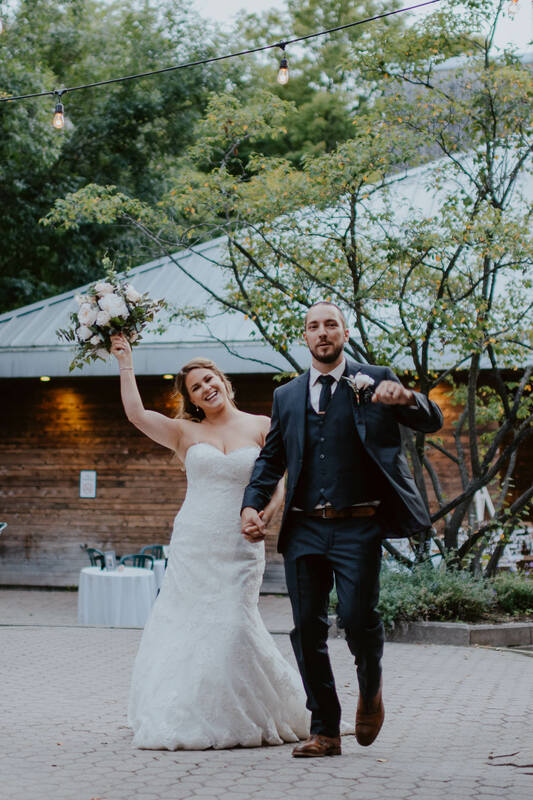 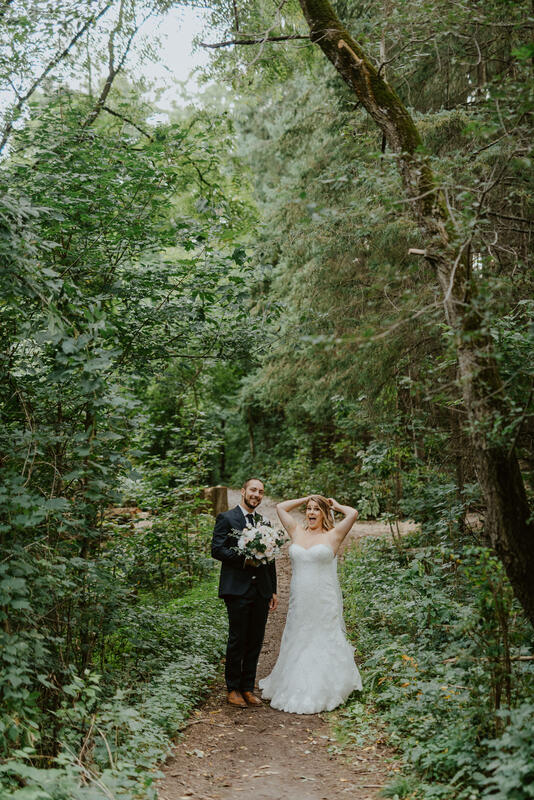 As outdoor enthusiasts The Kortright Centre was the perfect venue for their outdoor ceremony and reception. 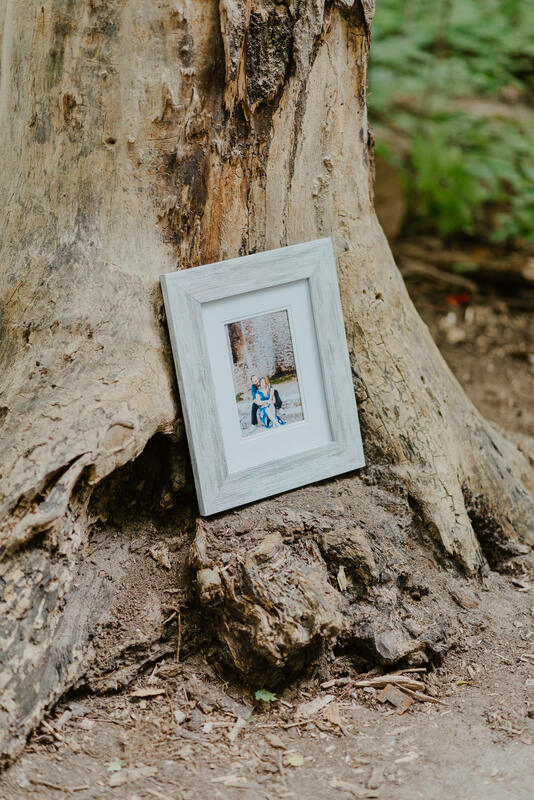 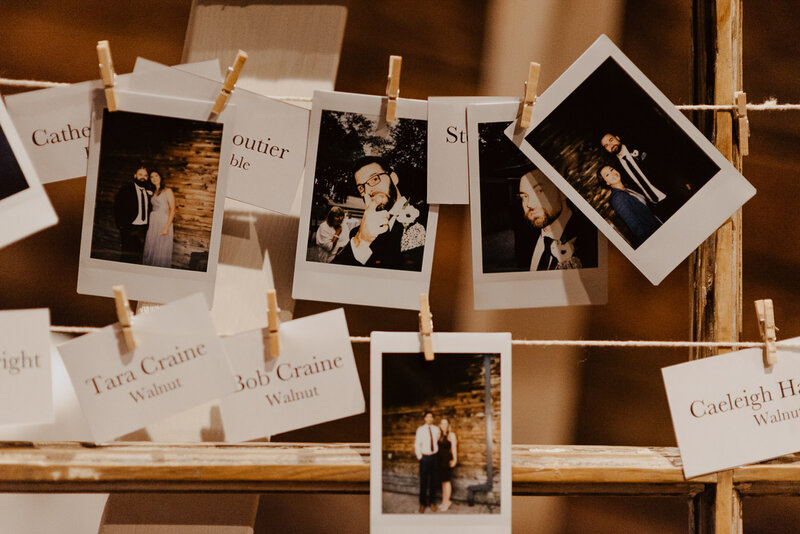 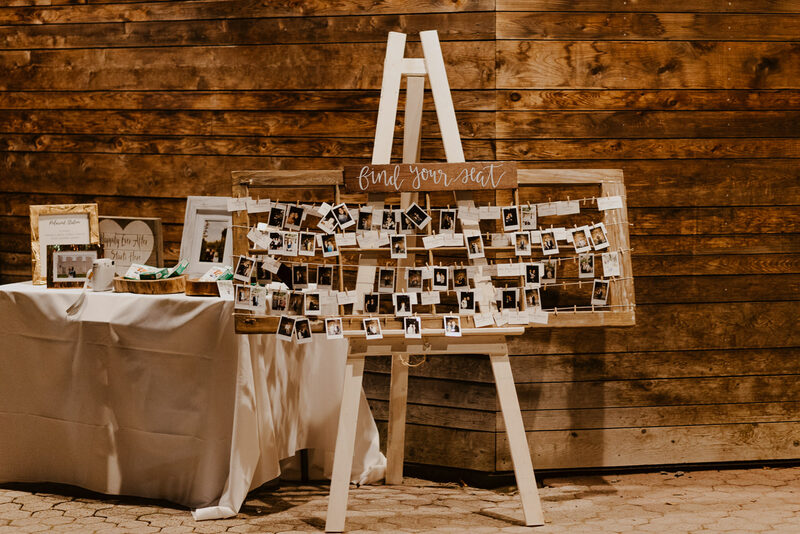 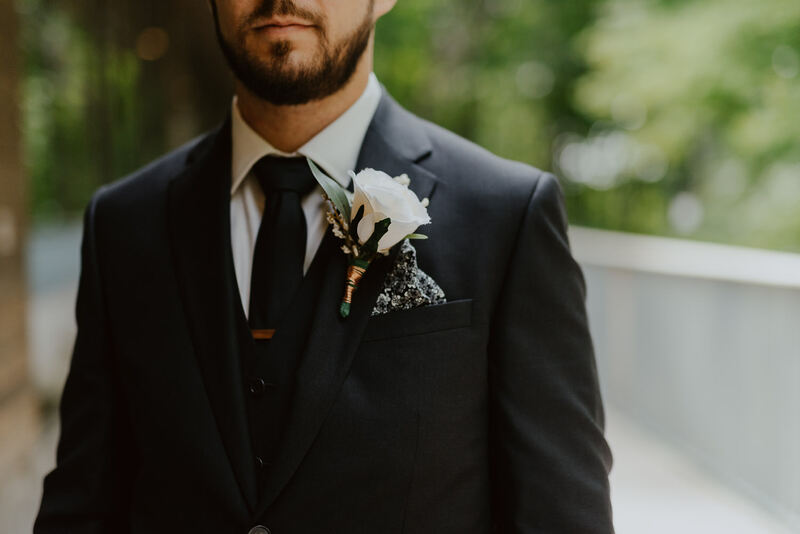 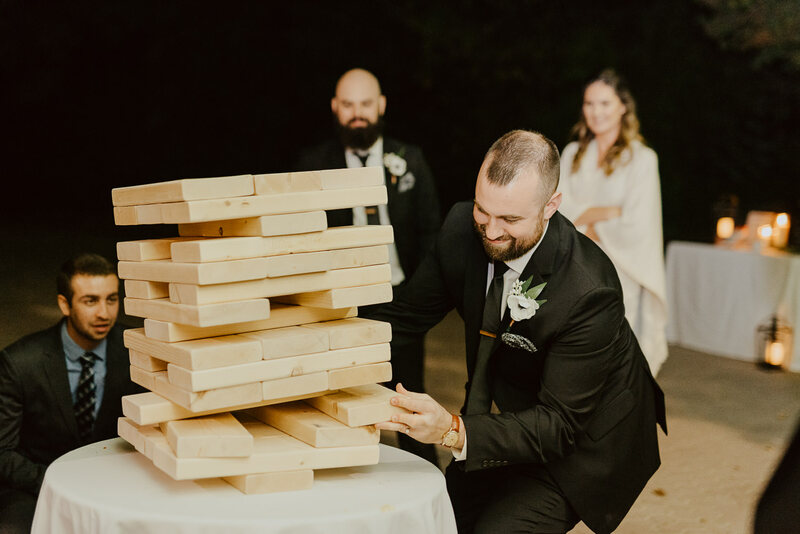 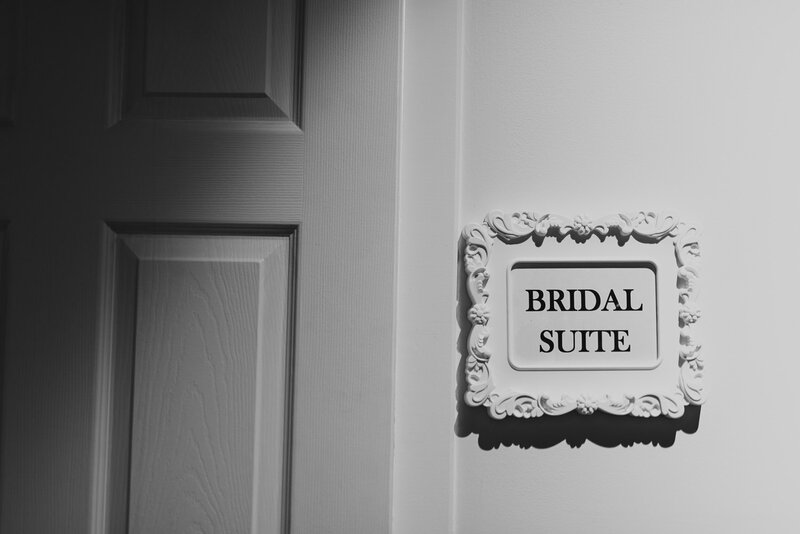 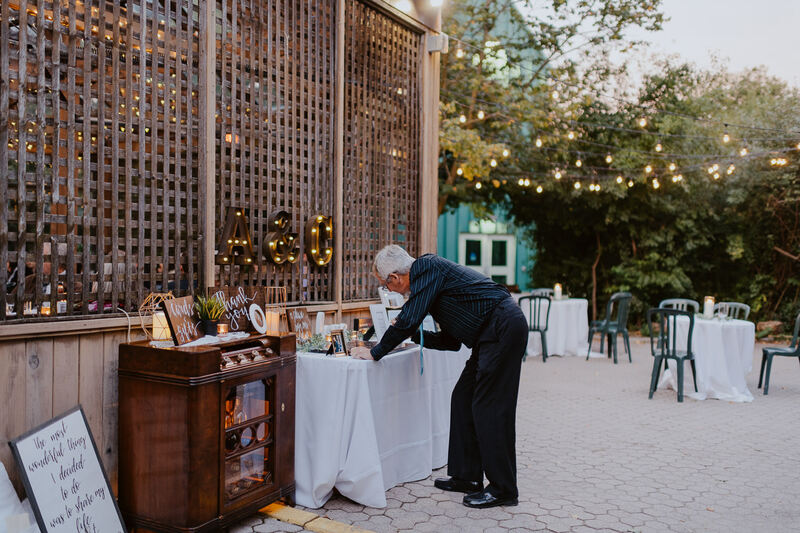 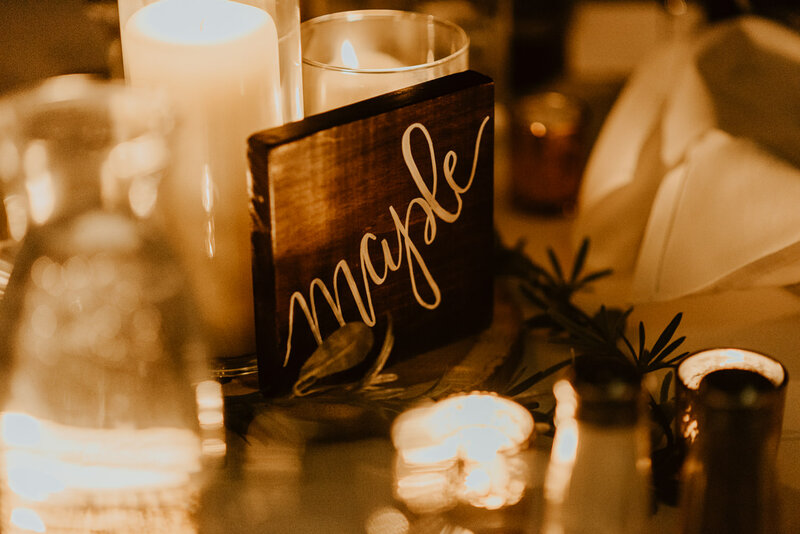 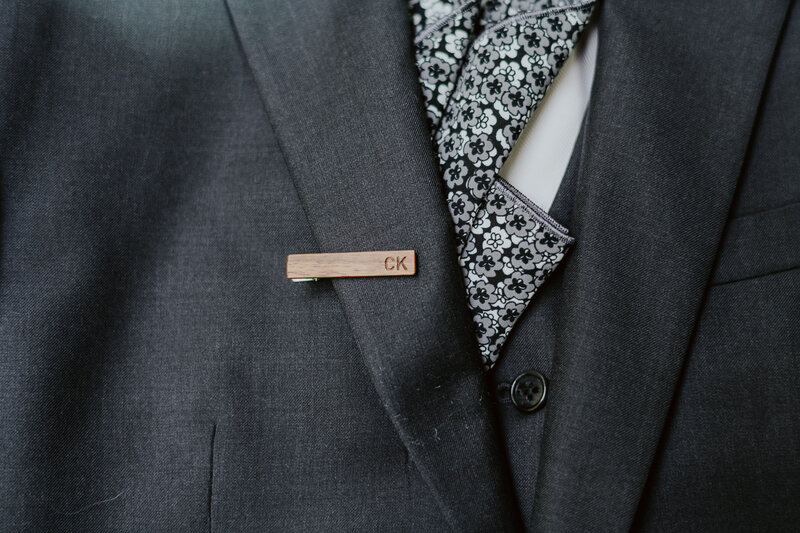 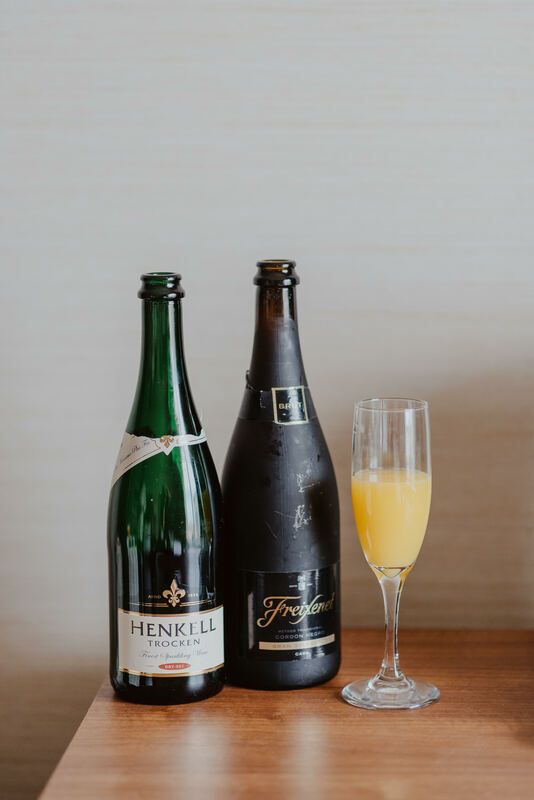 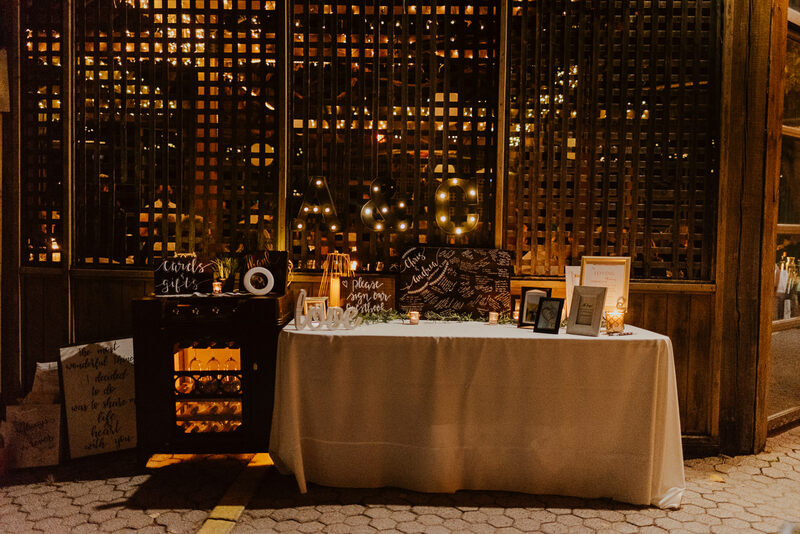 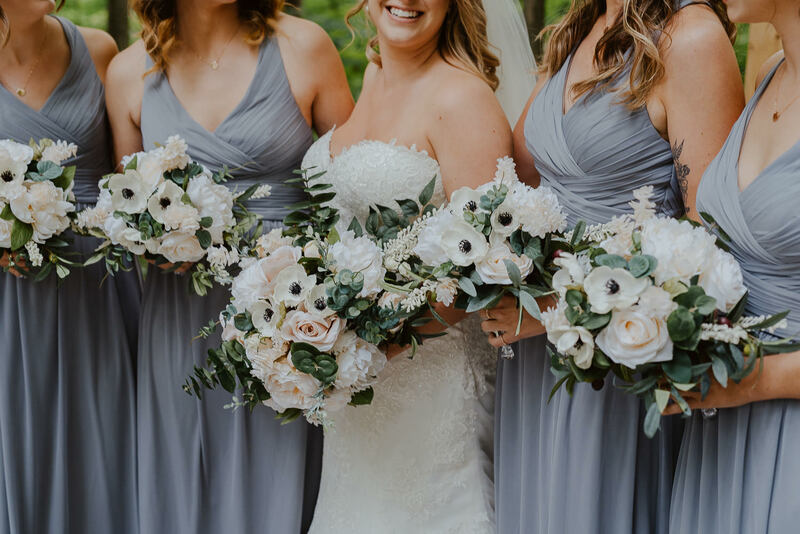 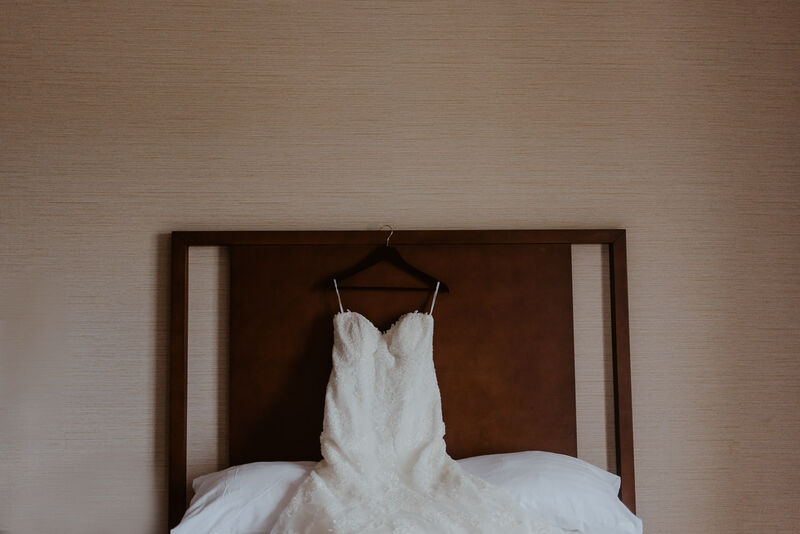 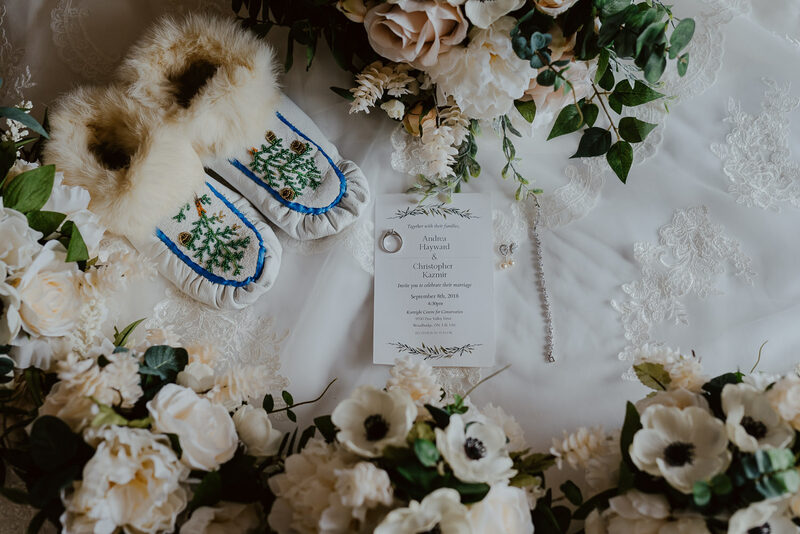 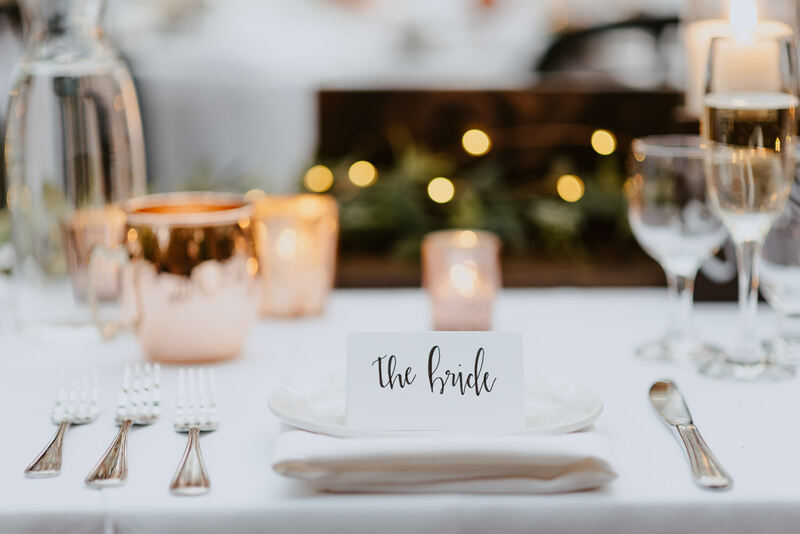 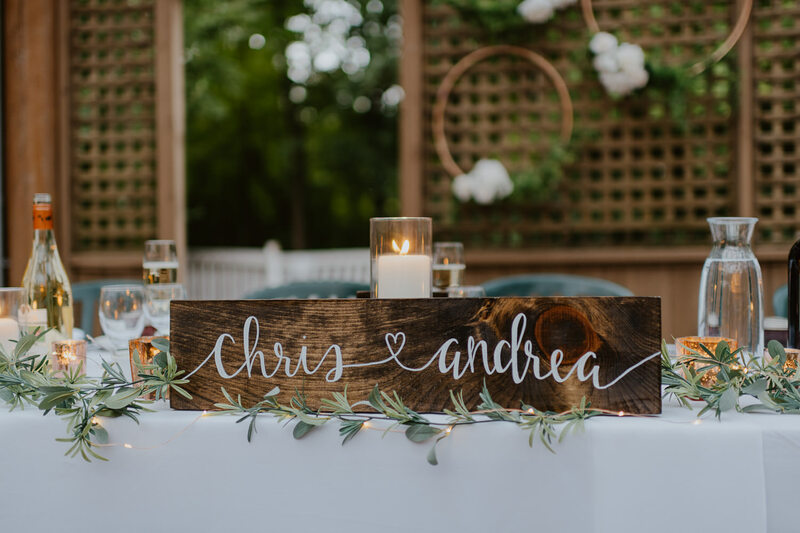 Andrea and Chris’ wedding day was filled with beautiful DIY details. 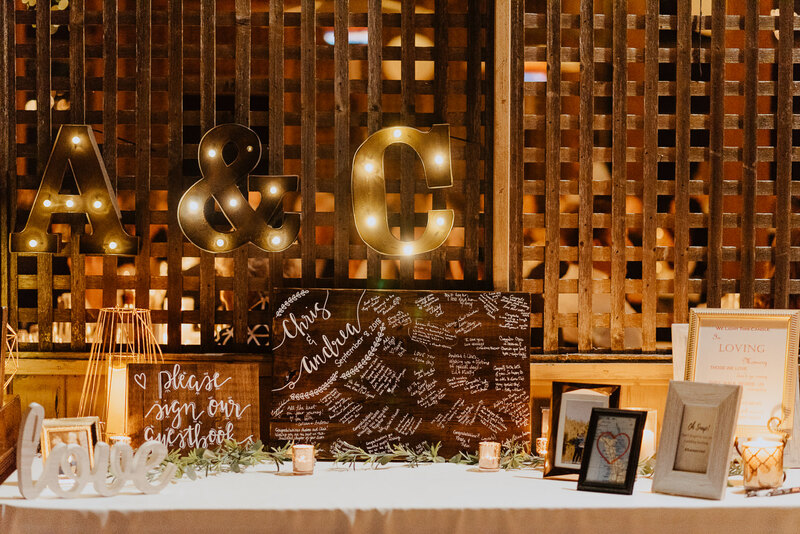 Wood signs with love sayings were displayed all around their entrance to their space. 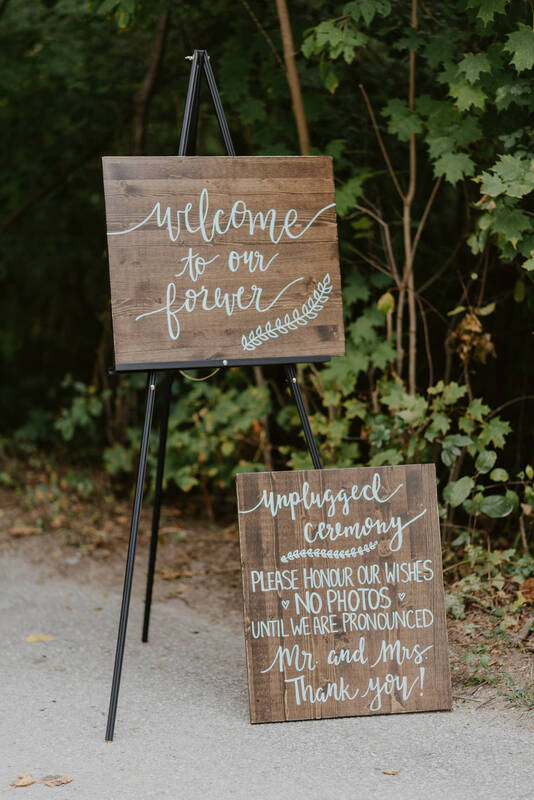 Chris hand cut all the signs and Andrea wrote the calligraphy on them. 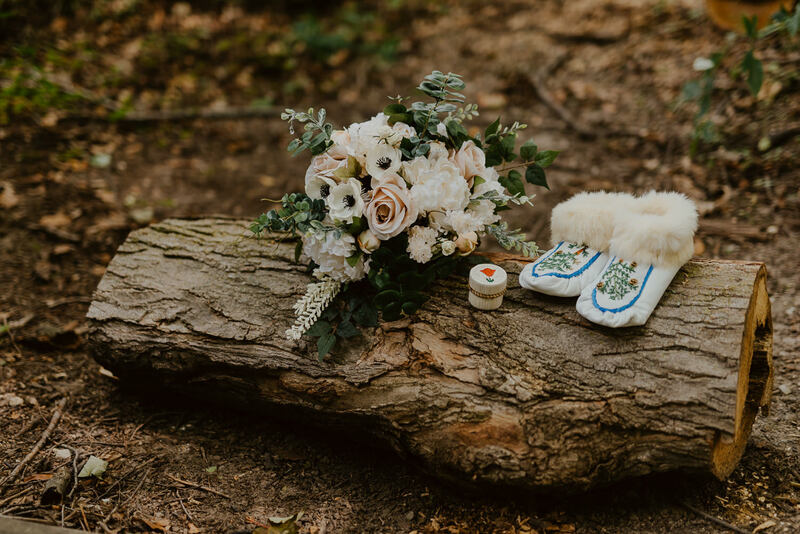 Andrea’s sister made her moccasins and her mom made her florals. 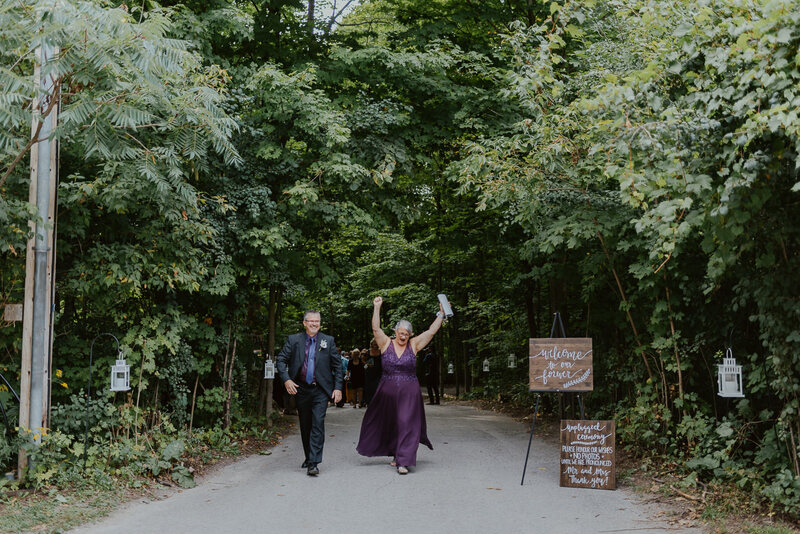 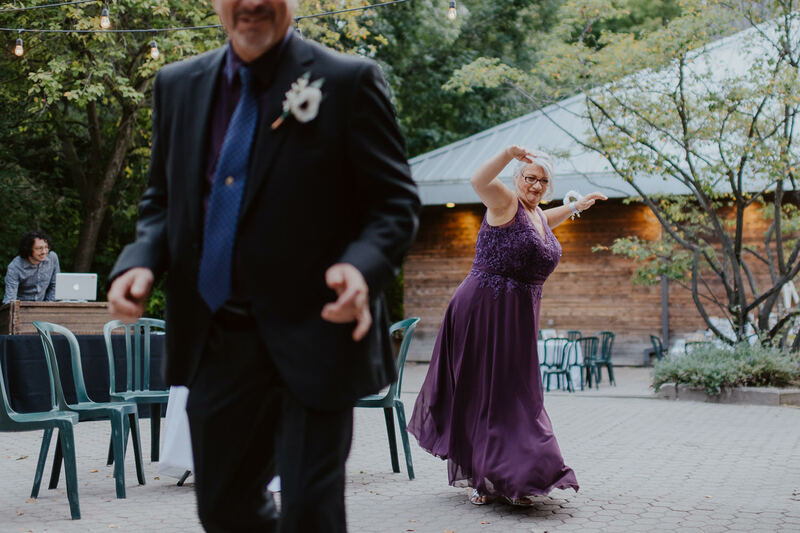 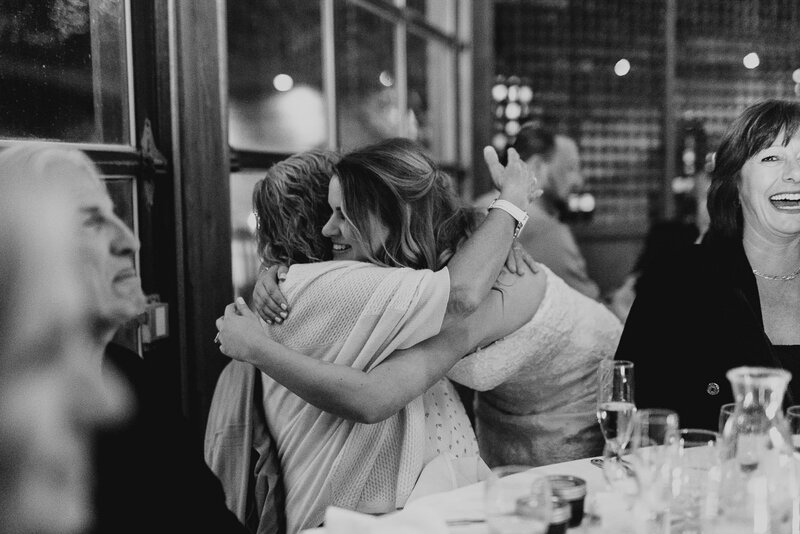 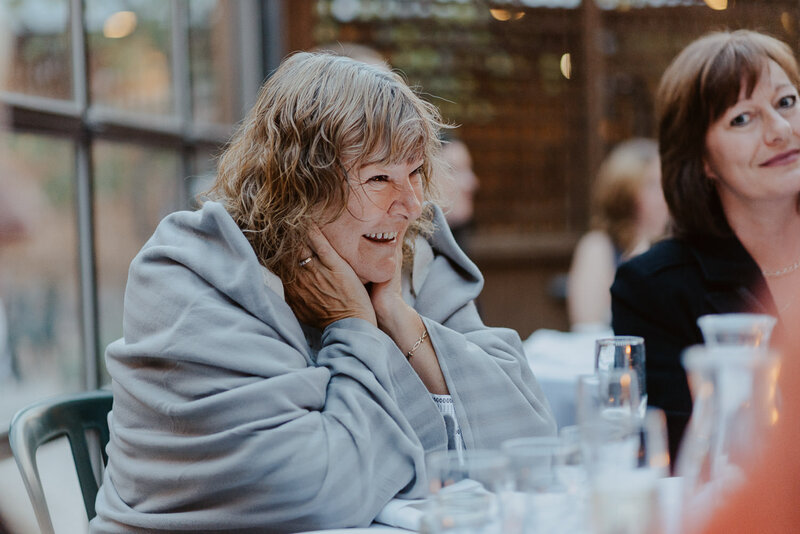 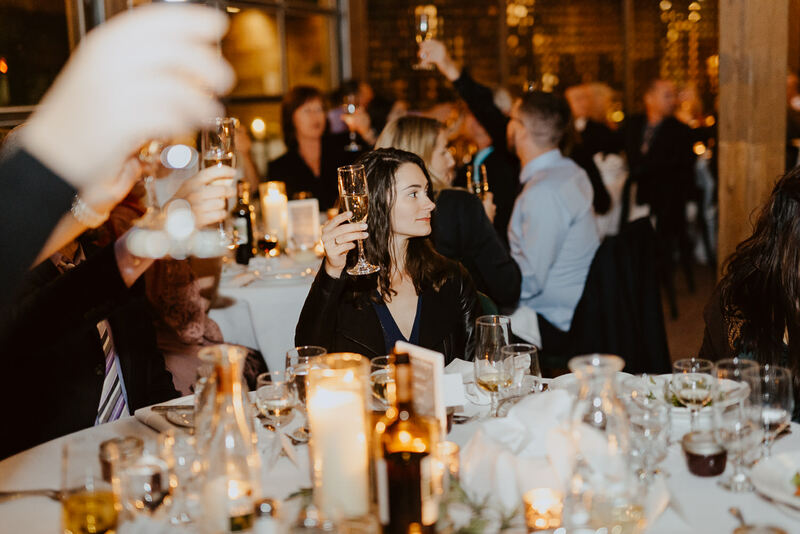 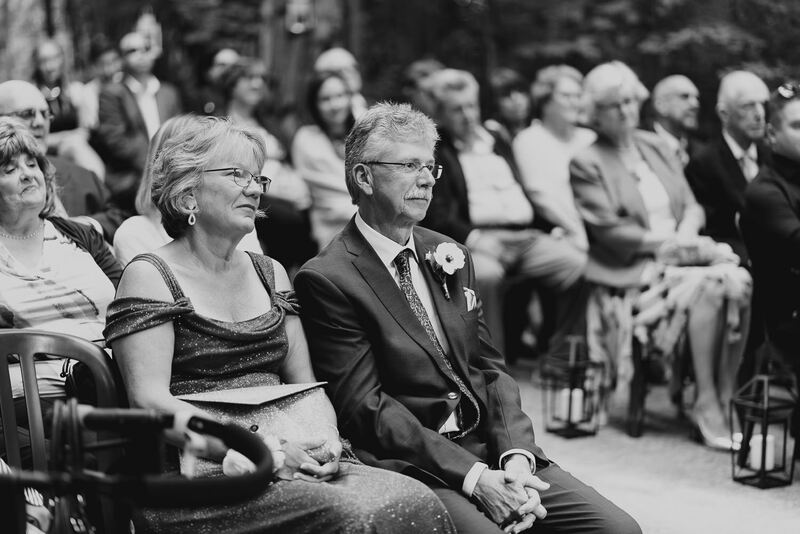 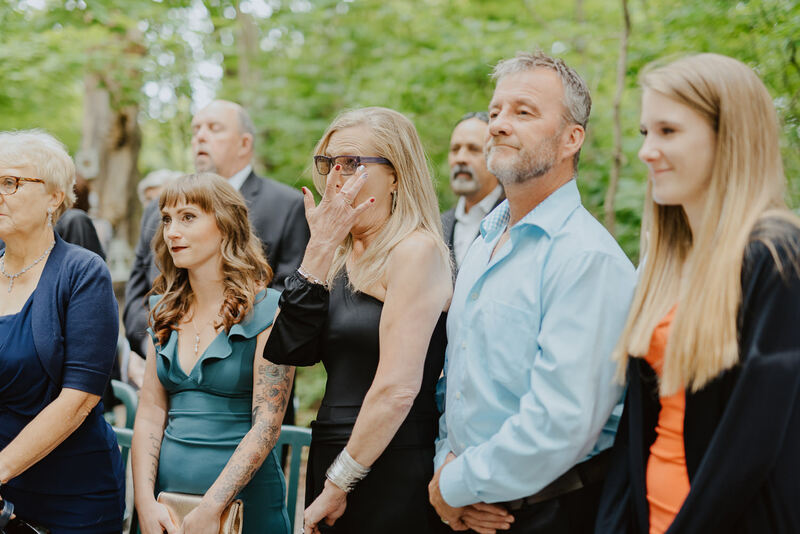 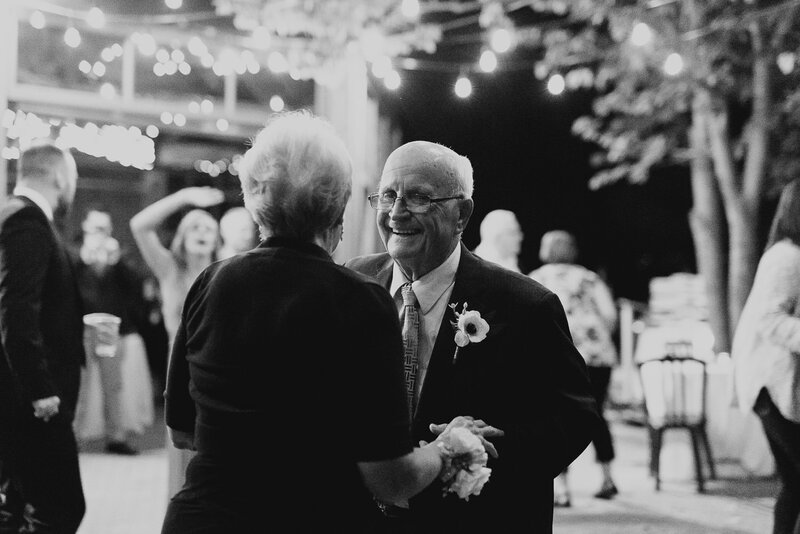 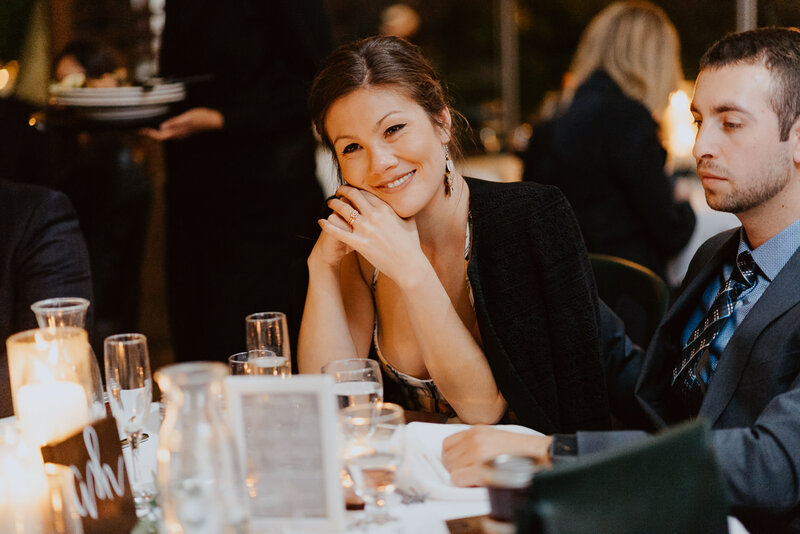 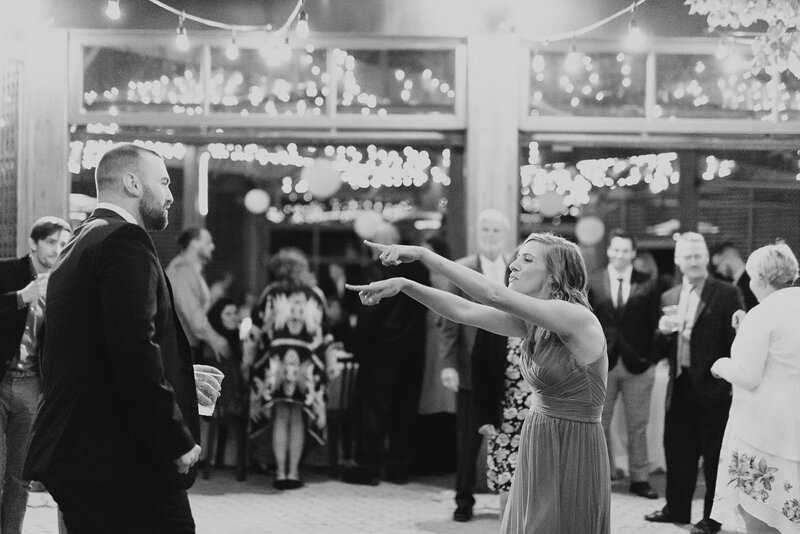 One of my favourite things about weddings are the spontaneous moments that happen. 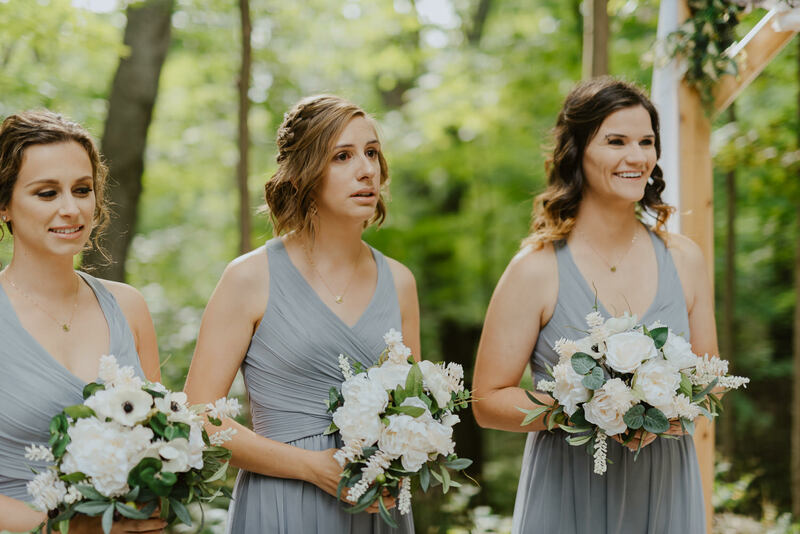 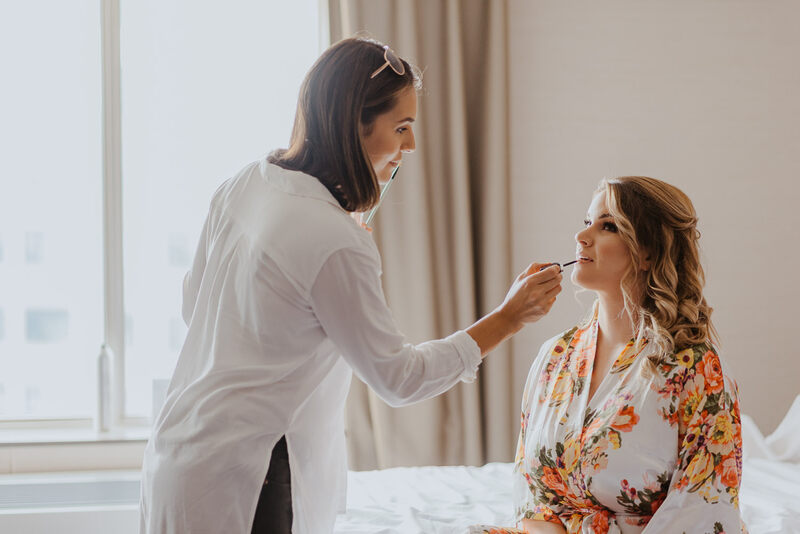 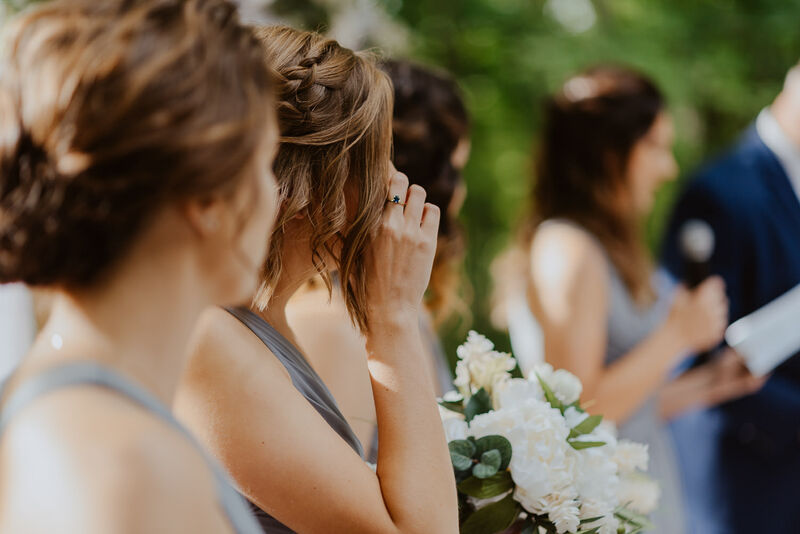 While Andrea was getting ready, one of her bridesmaids suggested she do a first look with her Dad. 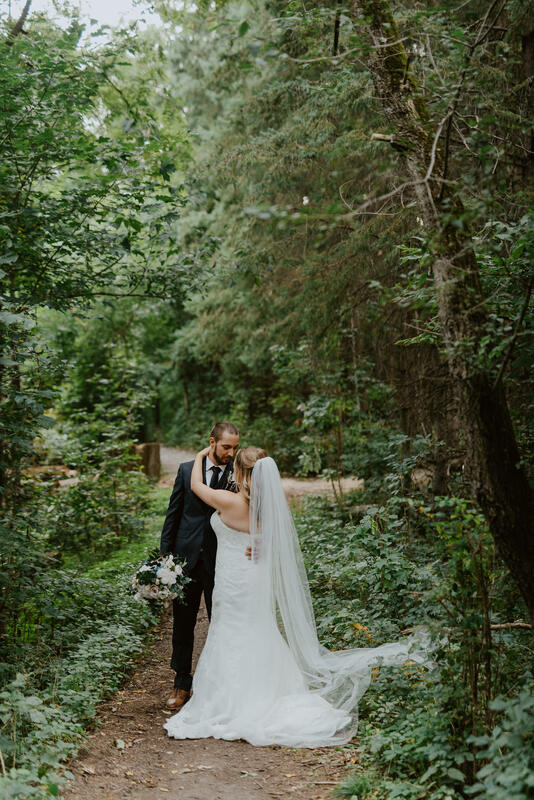 It was completely unplanned, but a perfect start to an emotional day. 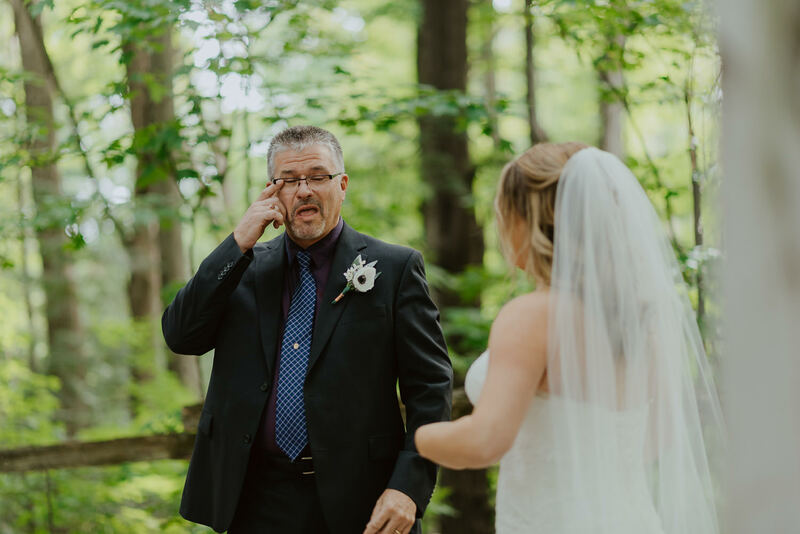 When her Dad opened his eyes and saw her for the first time in her wedding dress he teared up. 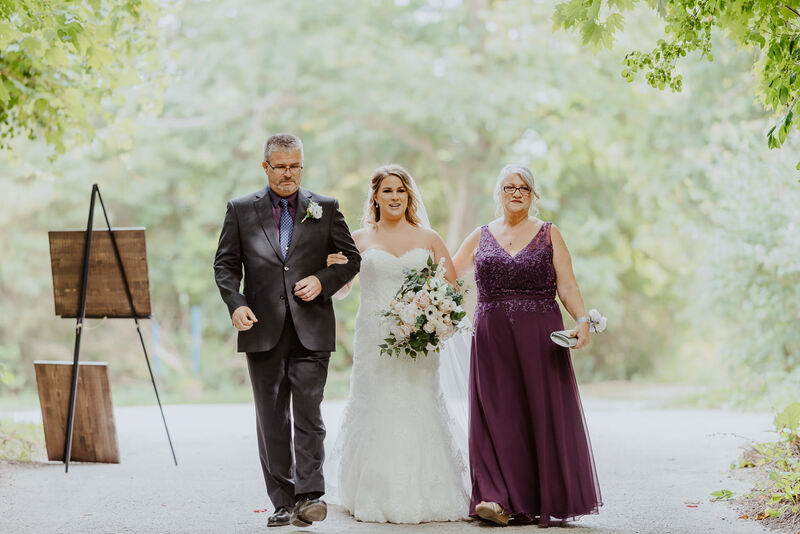 In that one moment I could see just how loved she was by her parents and it melted my heart. 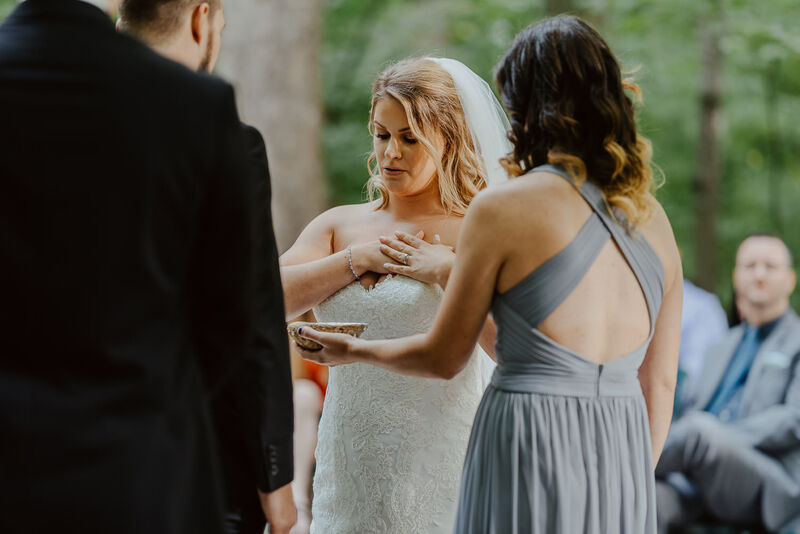 During the ceremony, Andrea paid homage to her native roots by burning sweet grass. 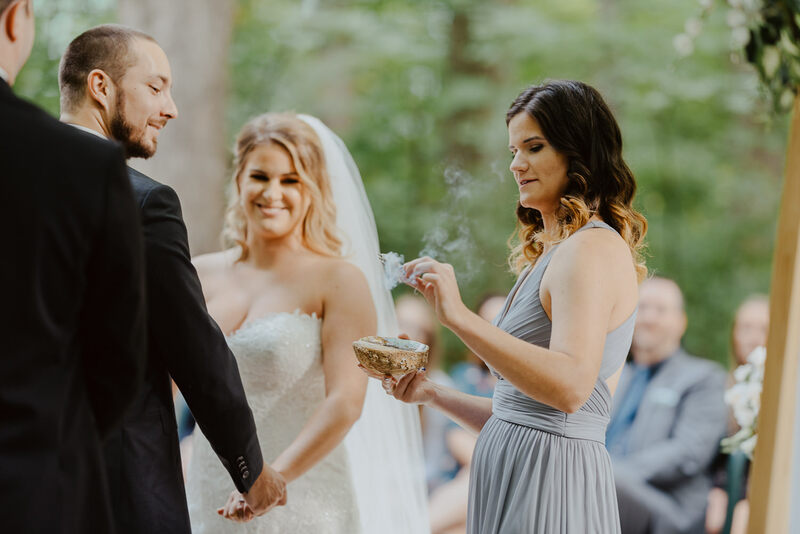 The burning of sweet grass is used to purify the ceremony and bring positive energy. 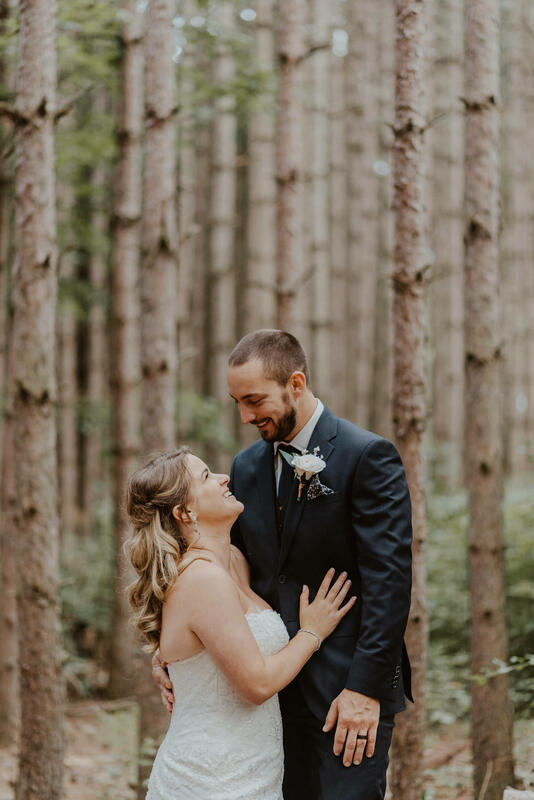 Afterwards we did photographed their portrait session amongst the tall trees. 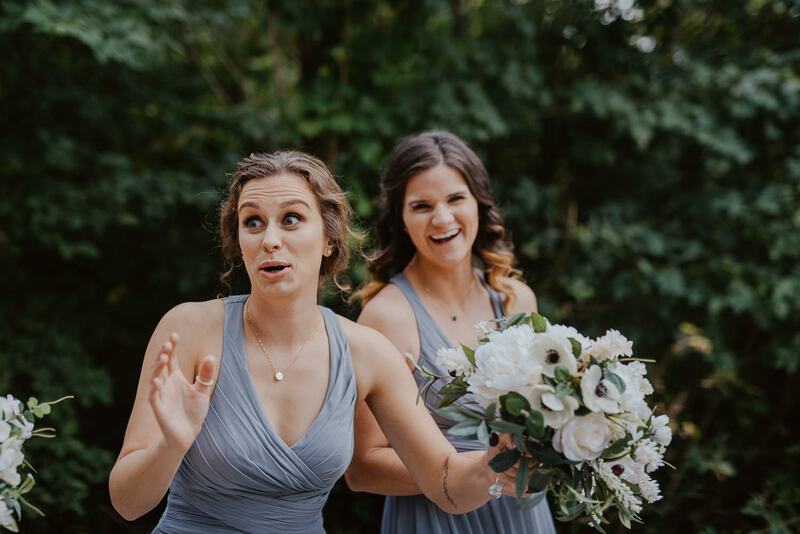 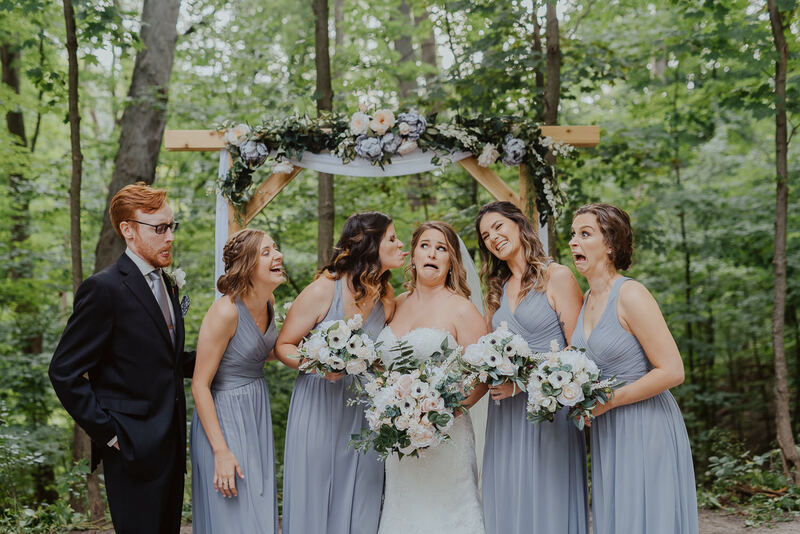 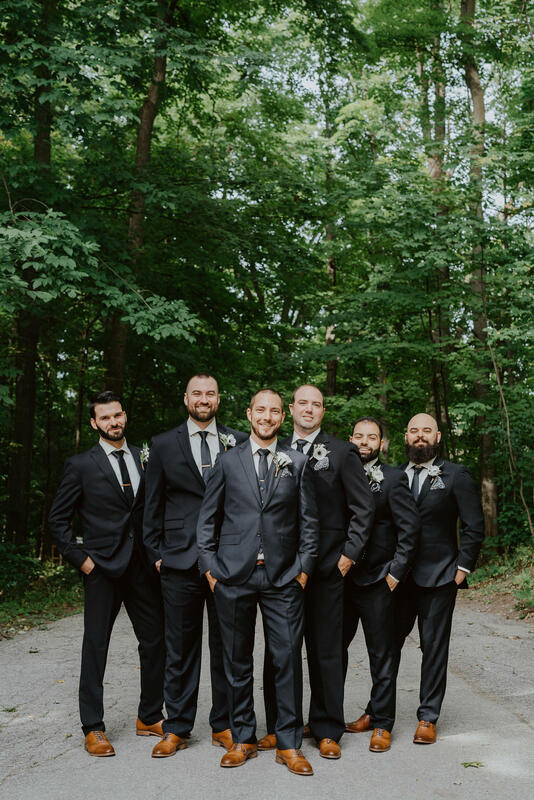 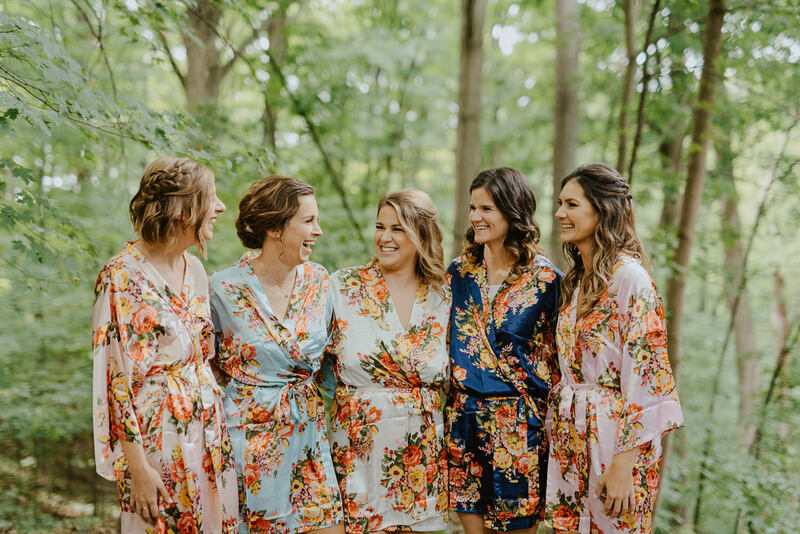 Andrea and Chris’ bridal party was by far the most expressive bridal party I’ve photographed to date! 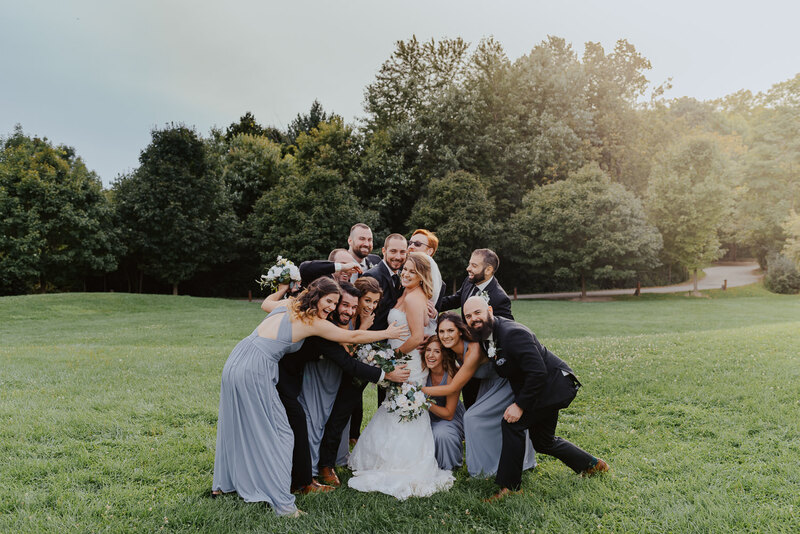 They kept the day fun and filled with laughter. 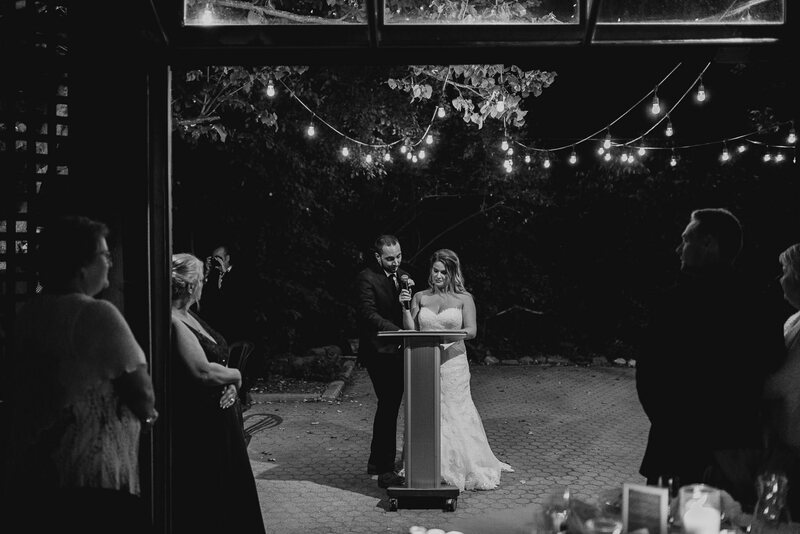 For their reception they had dinner and speeches in the glasshouse. 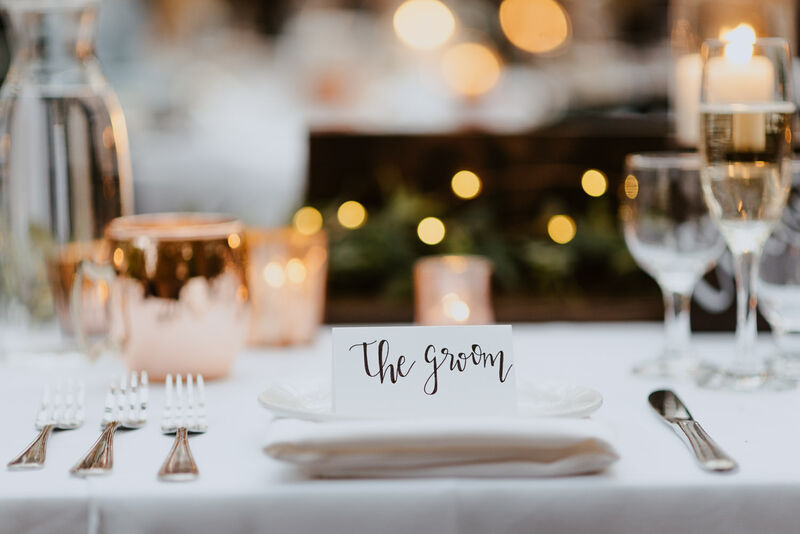 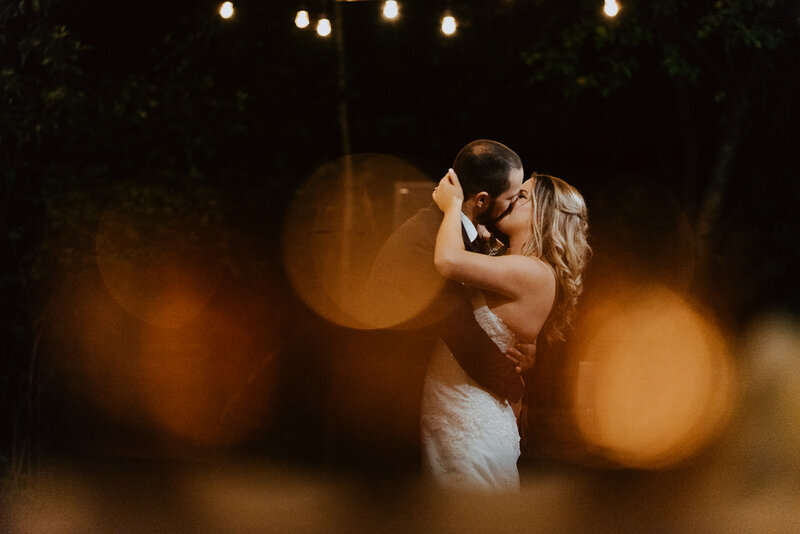 Pro tip for couples planning their wedding day… you can never have too many twinkle lights! 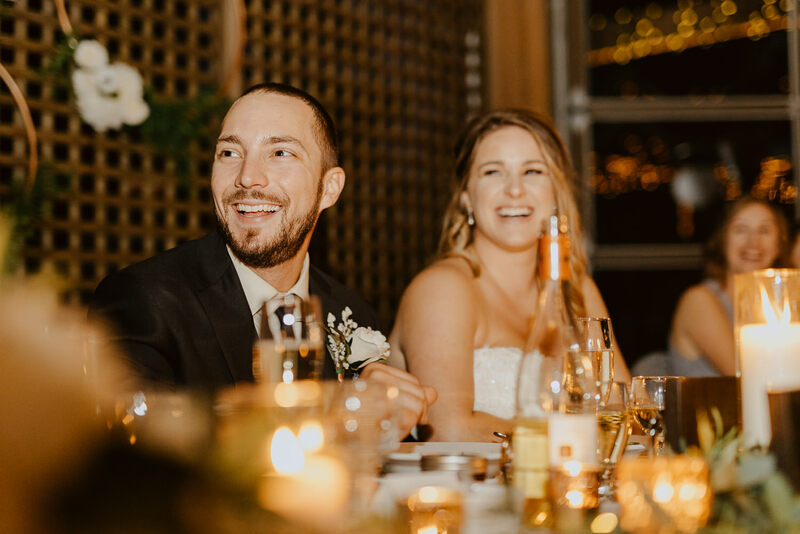 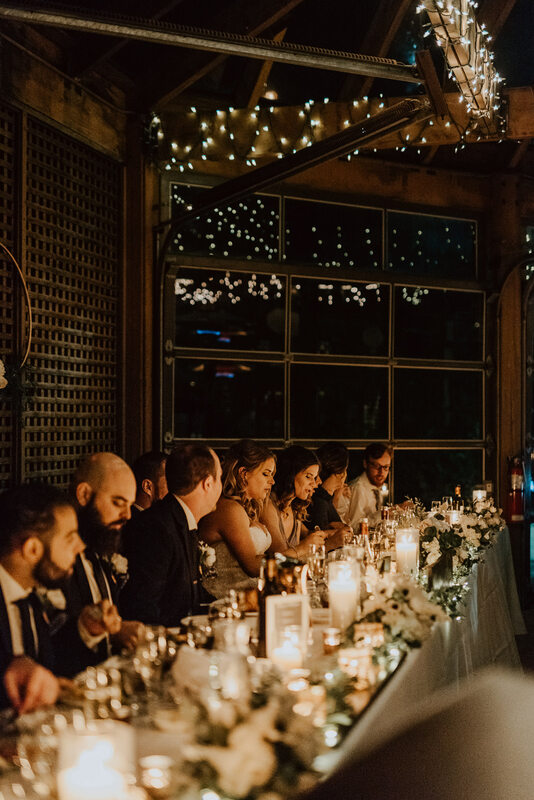 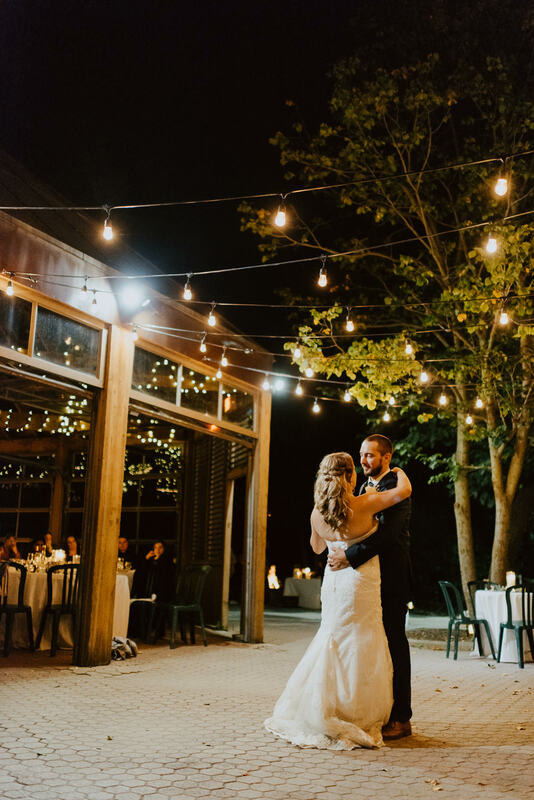 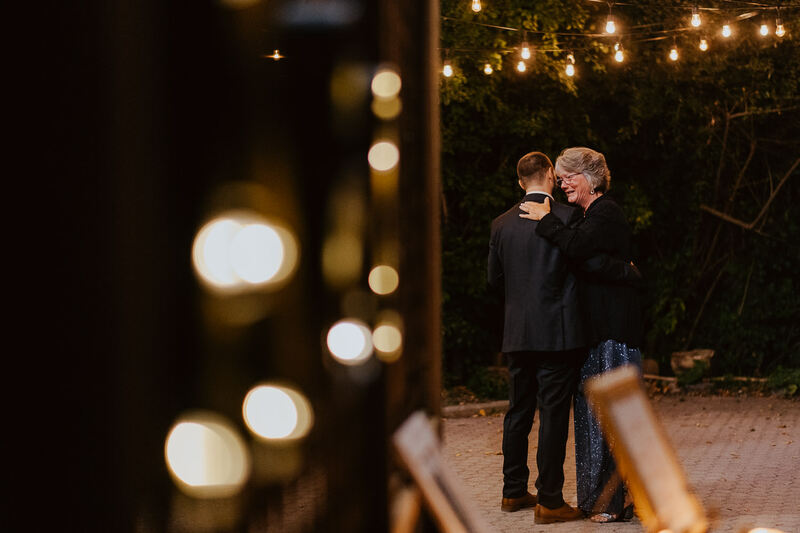 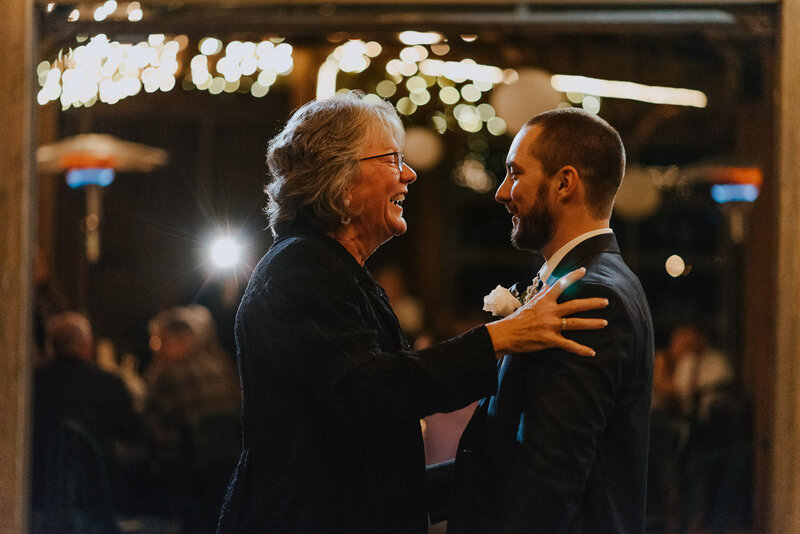 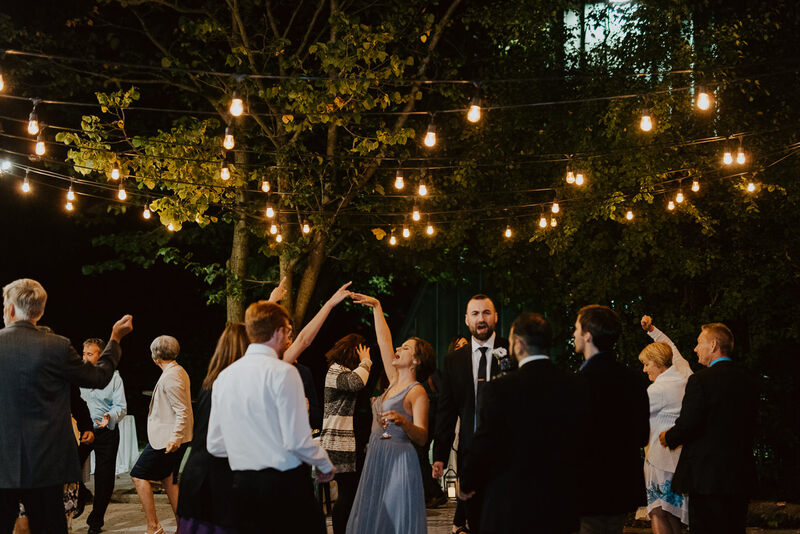 The lights added to the mood and overall warmth of their reception. 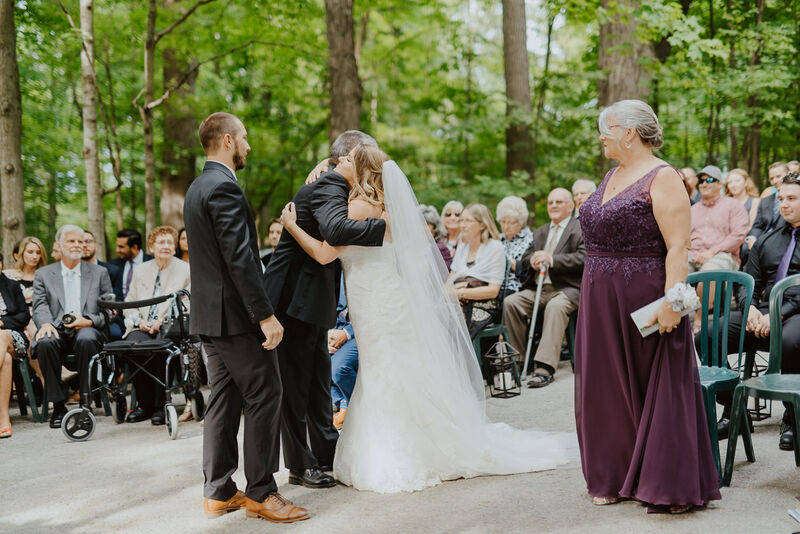 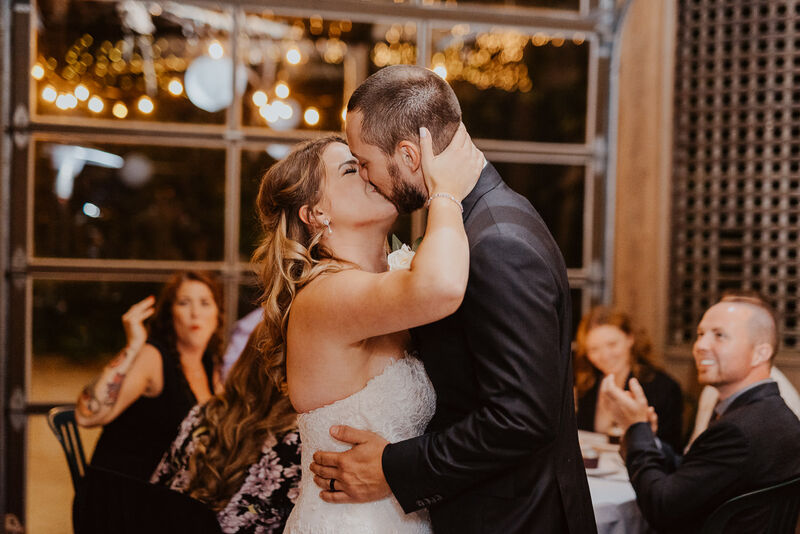 For their kissing game, guests had to sing a song with the word love in it to get the bride and groom to kiss. 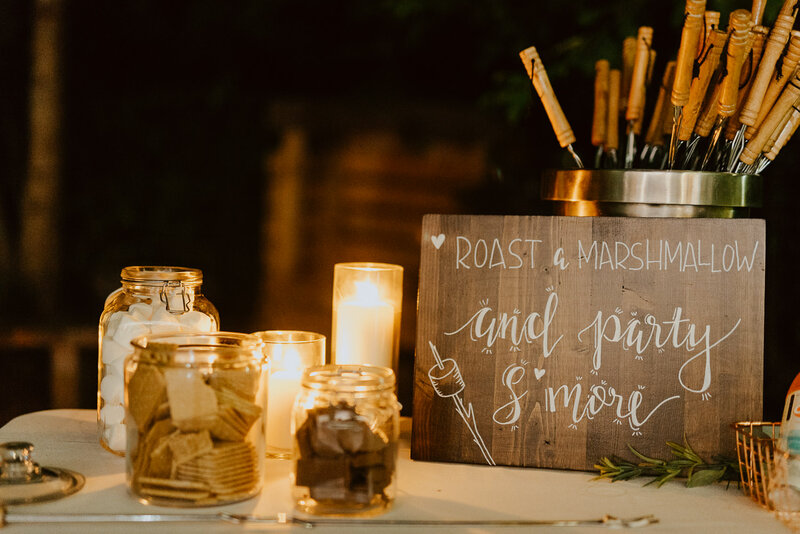 Guests also enjoyed the smore station and lawn games outside. 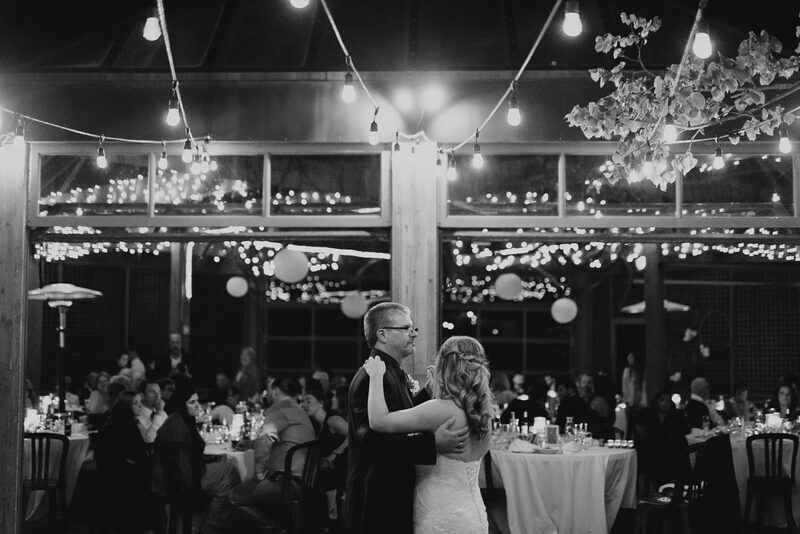 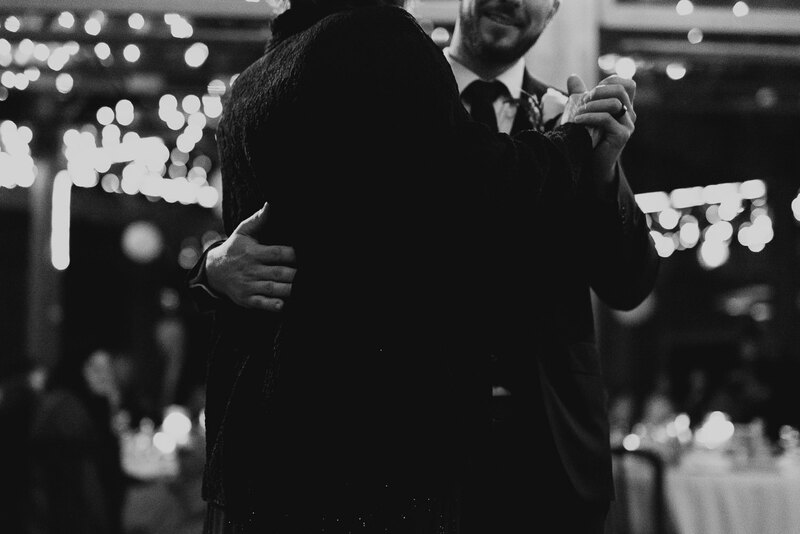 The night ended with the bride and groom first dance underneath the twinkle lights.